"Falkner Winery" is also located in Temecula, CA. It opened in July 2001. You can find 2-for-1 or free Wine Tasting coupons, if you check their homepage. 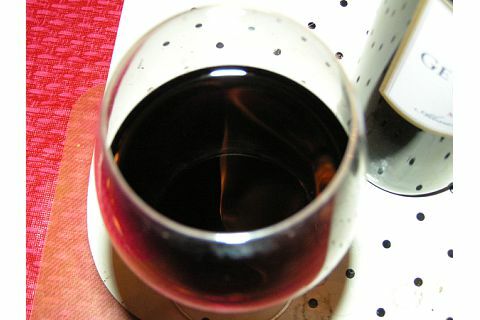 They have varieties of tasty red wines. 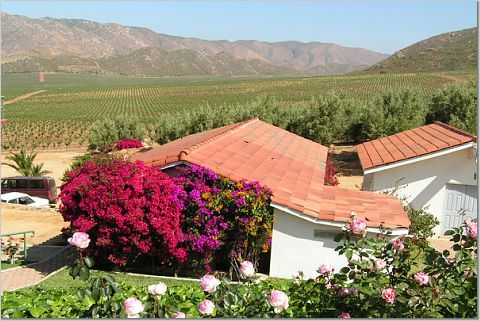 I applied "Free Wine Tasting" coupon in the morning leaving for Temecula, and it was emailed in a few minutes. One coupon is good for two people. 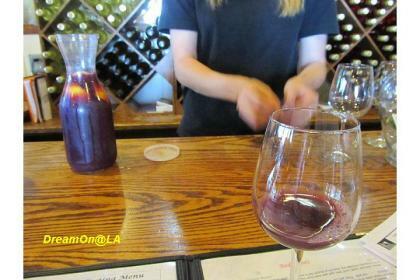 Wine tasting is $10 for 3 glasses of Wine and 1 Sangria. When you do a free Wine tasting, you don't get to keep the log wine glass. 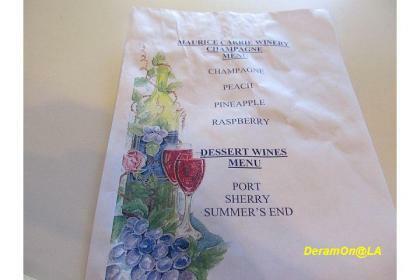 They also served White Wine Sangria. 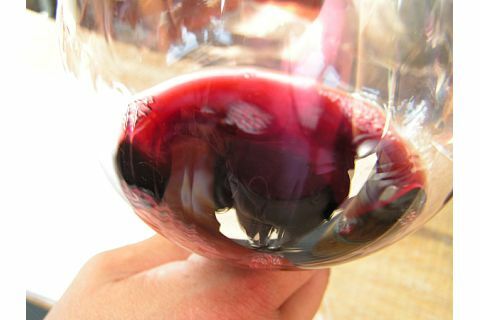 Deep ruby red in color and rich in flavors, this wonderful wine provides flavors such as blueberry, cherry, and black pepper in the long, smooth finish. 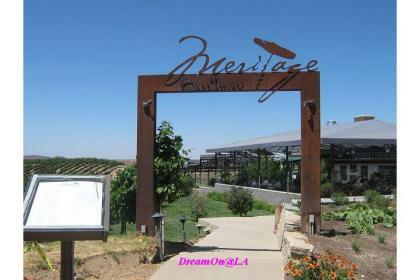 They make great "Meritage" wine all the time. 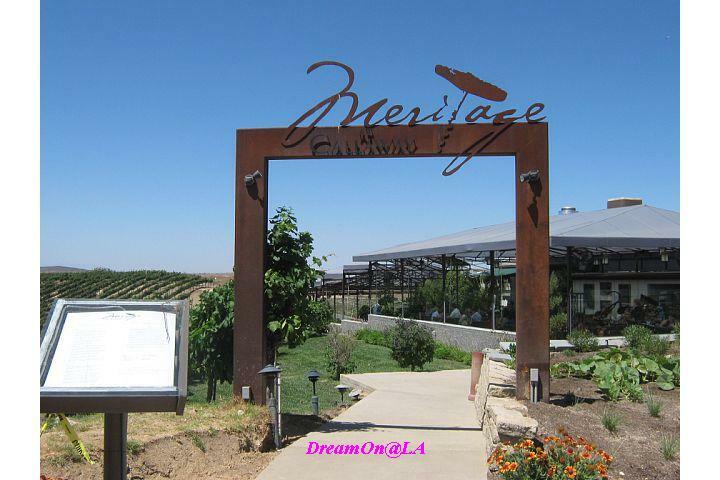 Meritage is a blend of 50% Cabernet Franc, 30% Cabernet Sauvignon, and 20% Merlot. 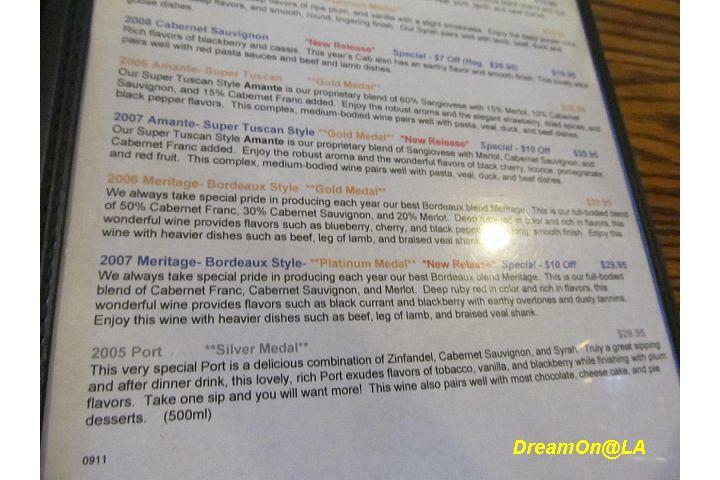 There are many wine varieties with award medals. 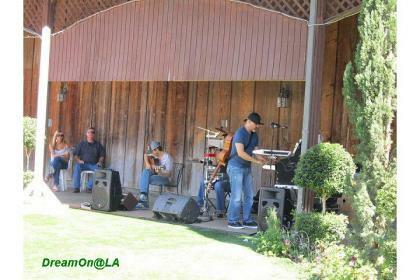 They had entertainment of American Rock band in the afternoon and evening. You get nice breeze and great view from the patio in front of the entrance. 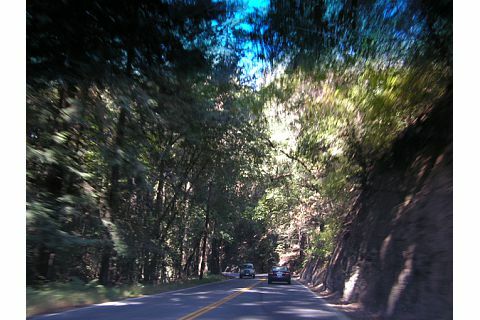 It's about 23 miles (36 KM) from the Pacific Ocean. The winery owned restaurant is located in the back. 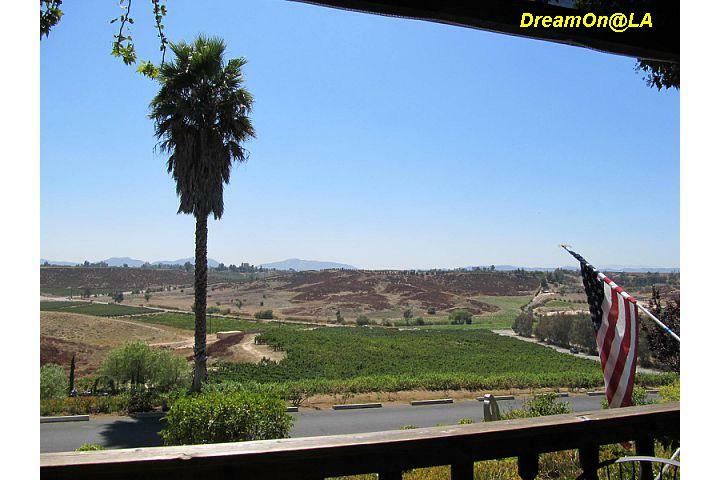 You get 180 degree view of wine fields from there. 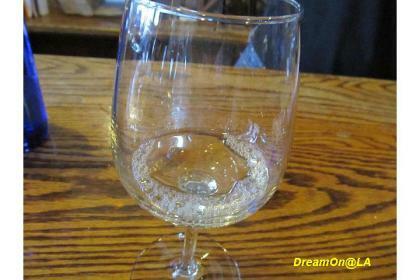 It was my 6th visit to this winery, but maybe it's first time to write an article on this blog. 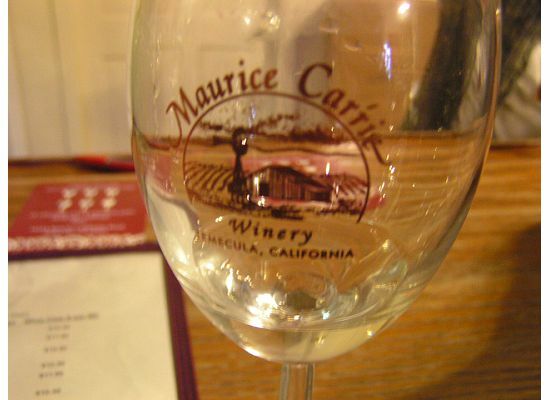 "Maurice Carrie Winery" is located in Temecula wine country. 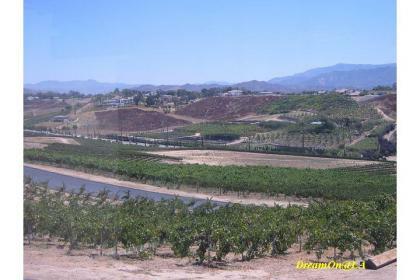 We had a short trip to Temecula on Saturday, September 3, 2011. At "Maurice Carrie Winery", they have freshly baked "Brie Cheese Bread". It's baked fresh in 15 minutes after you order. 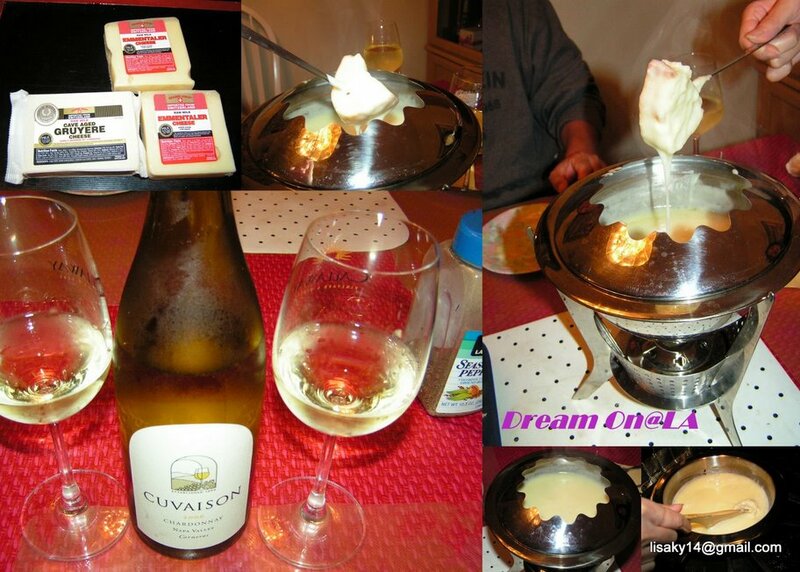 While waiting for "Brie Cheese Bread" to be baked, we did Champagne tasting. Champagne Tasting is $10 for 4 glasses. First, regular champagne. 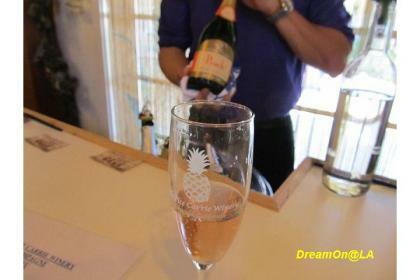 2nd was Pineapple Champagne (the best seller here). 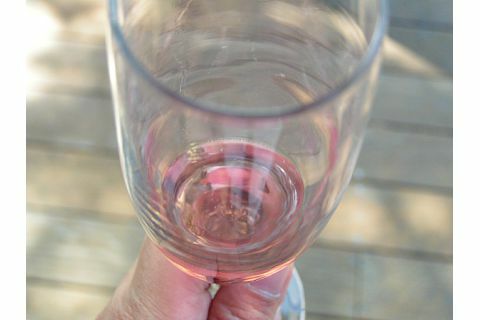 3rd was Peach Champagne. The last was Raspberry Champagne. The line up of their Champagne, Sherry, and Dessert Wine. They have Wine Tasting bar, too. It's $10 for 5 glasses. It's very hot, fresh from the oven. 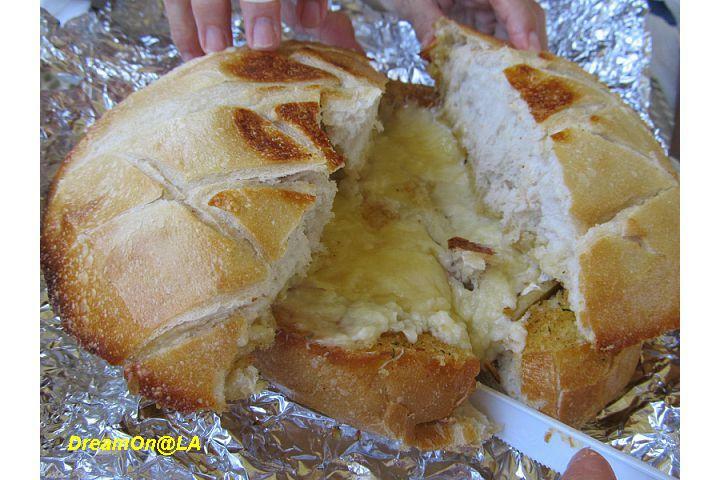 It's baked crispy outside and soft Brie Cheese and Garlic Herb Butter is melting inside. 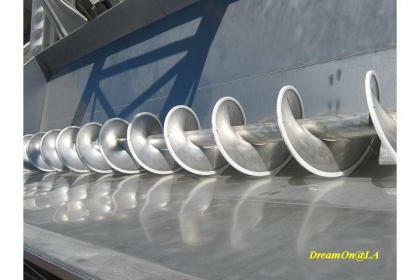 The size is about 12 inch in diameter. Good for 4 to 5 people. 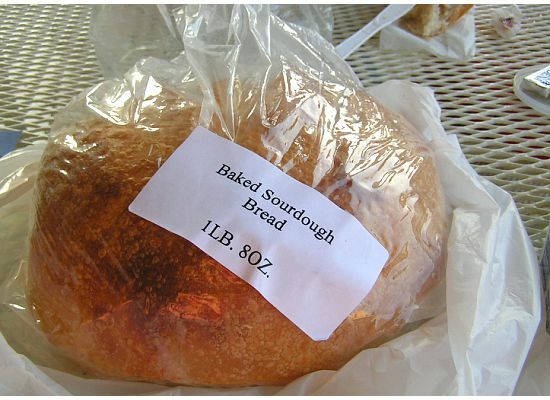 They also bake Sourdough Bread ($3.99) every hour. 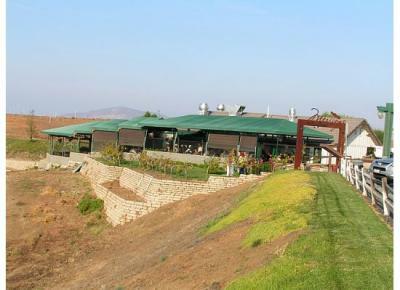 The winery opened a restaurant at the right side. 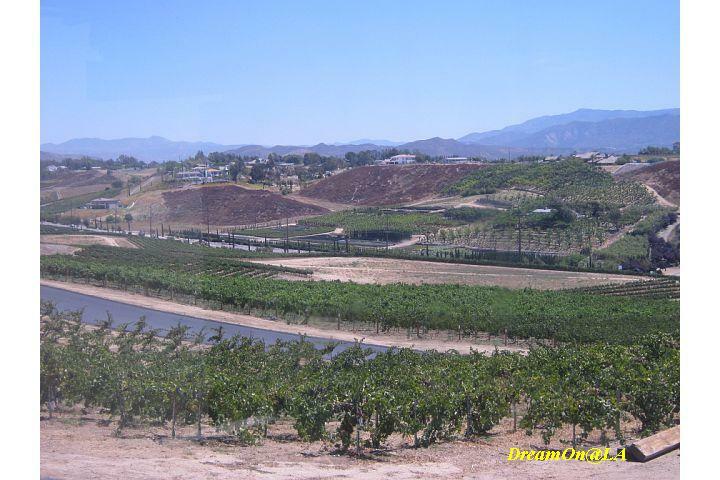 20 years ago, there were only 8 wineries in Temecula. 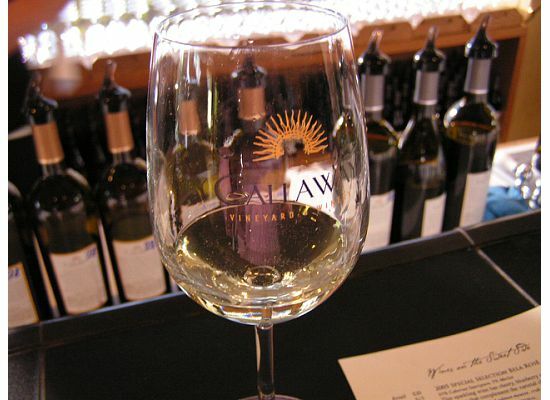 Now there are 34 wineries. 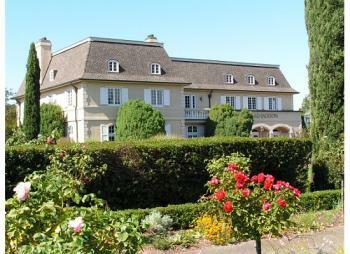 Some built Restaurants, Spas, and Hotels at the wineries, so it's a great place to visit. Temecula wineries were crowded with lots of people. 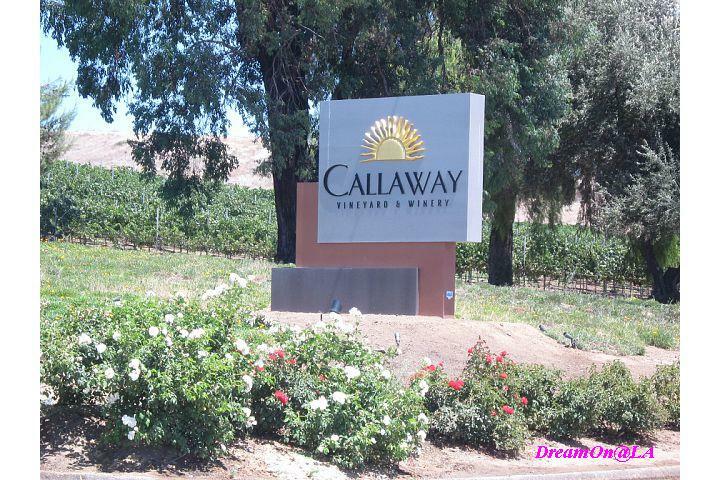 Callaway Winery: I visited Callaway Winery in Temecula, CA, 30 minutes south from Lake Elsinore, the hot-spring town, on Aug. 21, 2010. It's 2 hours from Los Angeles. Mr. Callaway, who is famous with Callaway golf clubs, founded this winery in 1969. Sorry for taking time to upload this article. 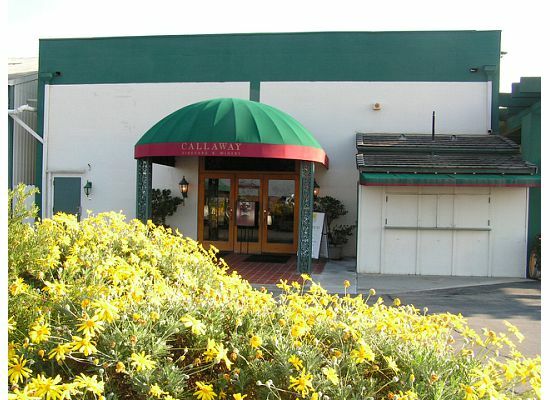 Ely Callaway sold the winery in 1982 to go on to making golf clubs. Privately owned, Callaway Vineyard & Winery was purchased by the Lin family of San Diego upon the dissolution of industry leader, Allied Domecq Wines, in late 2005. 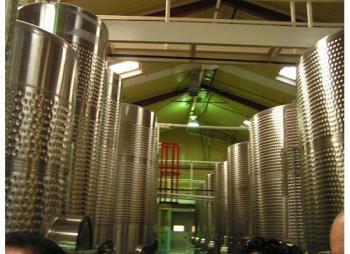 They changed the winery to a private and premium winery, producing small volume of quality wines. 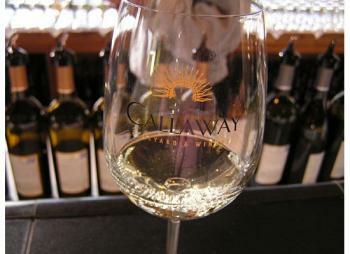 Callaway Vineyard & Winery wines are only available at the winery and are not available in any retail. 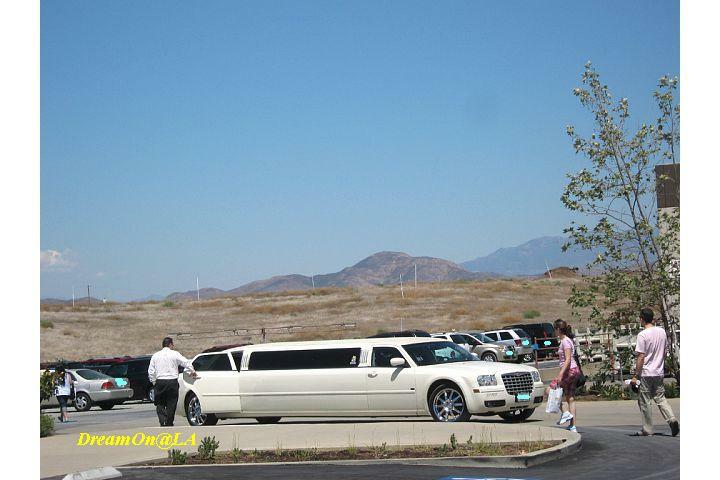 There is "Meritage Restaurant", and there was a group of college female students who came in riding a stretch limousine. 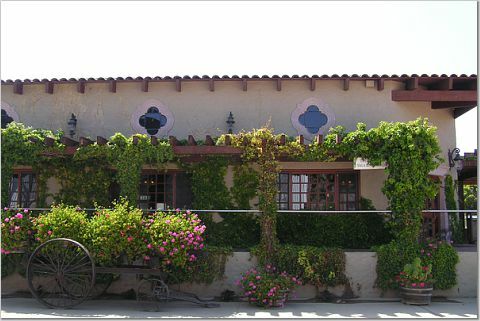 January is California Restaurant Month! 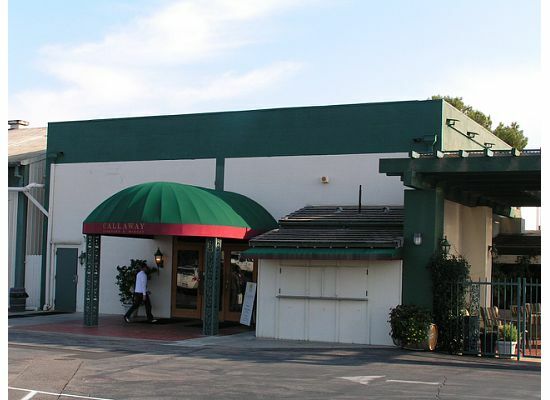 January has been declared California Restaurant Month. 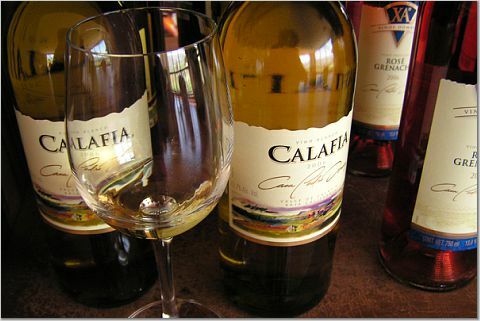 To honor the occasion, Chef Mike, Executive Chef at Meritage at Callaway, has created a special tapas and wine. 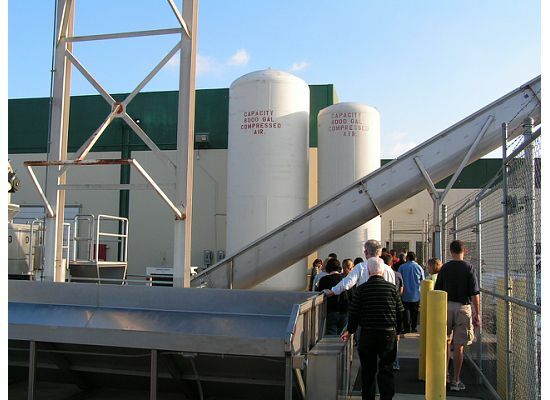 We enjoyed a free "Winery tour" once again. It's done every hour on weekends. 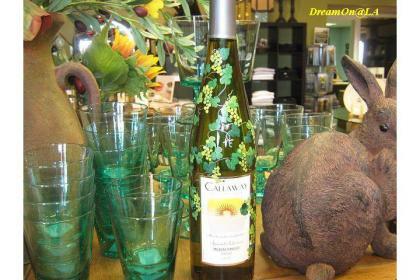 callawaywinery--June 10, 2008--Callaway Winery was founded in 1969 by Ely Callaway, who went on to gain fame and fortune in the world of golf. We browsed in the gift shop after the wine tour. The painting on the bottles is extra price. Stop in today and enjoy 30% off all bottles and 40% off all cases of the 2005 Special Selection Dolcetto. Quantities are limited. 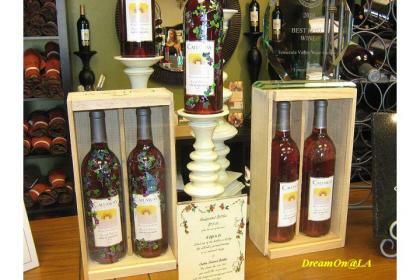 Every month, they have 40$ off special on one kind of wine at the gift shop. 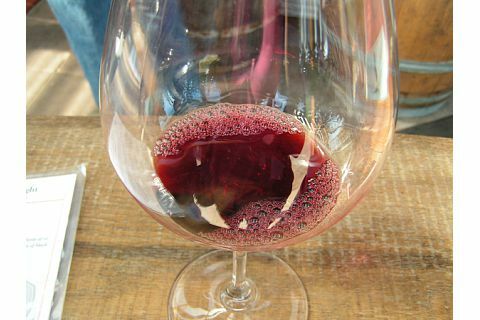 In August 2010, it was this wine. The regular price is $28 per bottle. 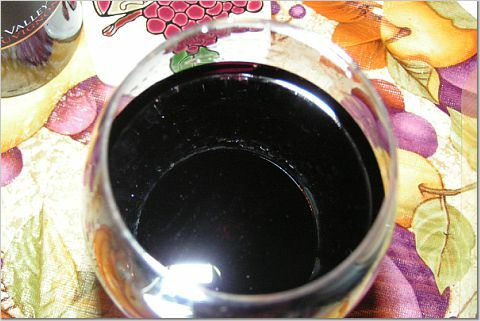 It was smooth in mouth and tasty red wine. There were only 8 wineries in Temecula until one decade ago. Wineries kept opening in Temecula from around year 2000. Now there are 31 wineries there. 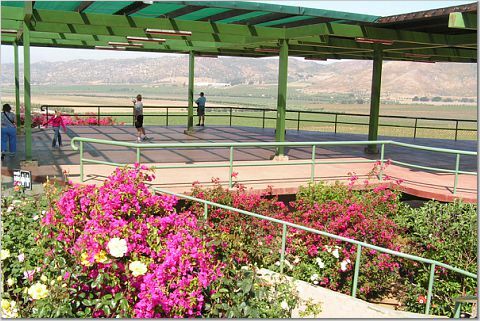 It's nice to visit some wineries there before going to the Lake Elsinore hotspring or the next day. I will attach the link to Temecula Valley Wine Growers site. You can save some with the coupons in the site. 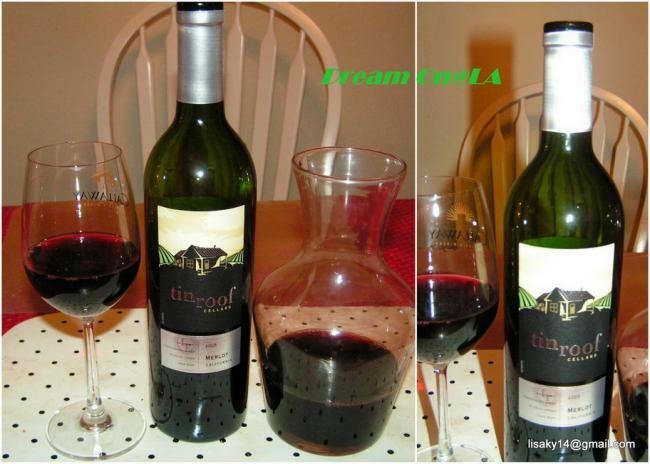 I will introduce "Tin Room Merlot 2005" wine that we tasted a few days ago. It was smooth and easy to drink. It has been stored in our wine rack for a long time. Probably somebody gave that to me as a gift. As I researched Internet, it is sold around $13. Wine Enthusiast magazine gave 90 points. It goes well with Beef, Chicken, Pasta, and probably anything. 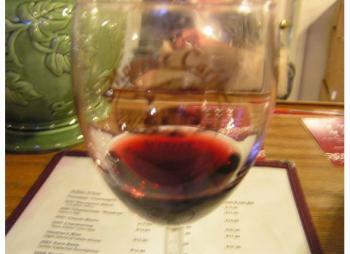 Tin Roof 2005 Merlot was produced from a blend of North Coast and Central Coast grapes. Merlot thrives in these cool-climate regions, especially in moist alluvial soils where it develops the bright fruit and soft tannins that make the variety so appealing to premium wine lovers. 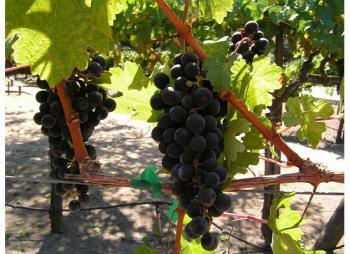 They also make Chardonnay, Sauvignon Blanc, Rose, Cabernet Sauvignon, and Syrah–Cabernet Sauvignon. 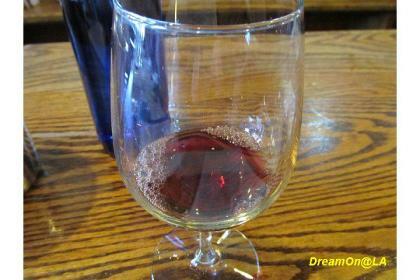 I am looking forward to tasting another variety of wine from Tin Roof Cellars. It seems it's sold at a lot of liquor stores and markets, including Costco. Geyser Peak 2005 Sauvignon Blanc, sold around $10 in USA, and around $22 to $27 in Japan. I had this wine a few days ago. It is smooth, light, and tasty. 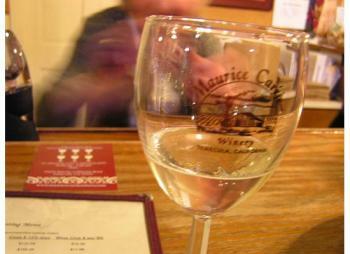 The winery uses selected grapes from several vineyards to make this wine. It is fruity and refreshing. It goes well with Seafood. 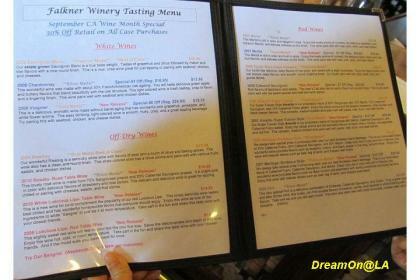 On 8/2/08, I introduced Geyser Peak Merlot 2005 wine on this blog and on 8/30/08, I visited this winery. 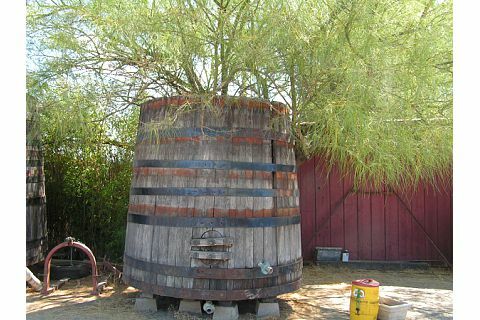 It's located in Alexander Valley, northern California. 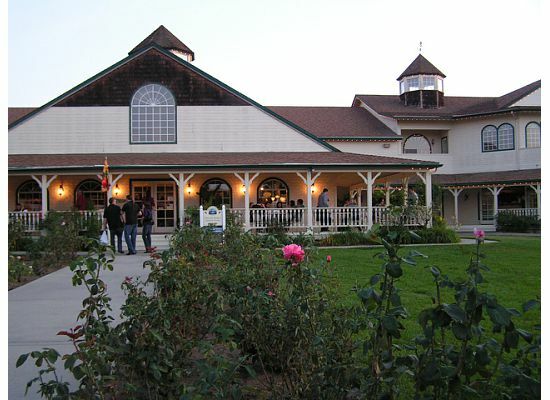 The Geyser Peak Winery was established in 1880. It has 128 years history. 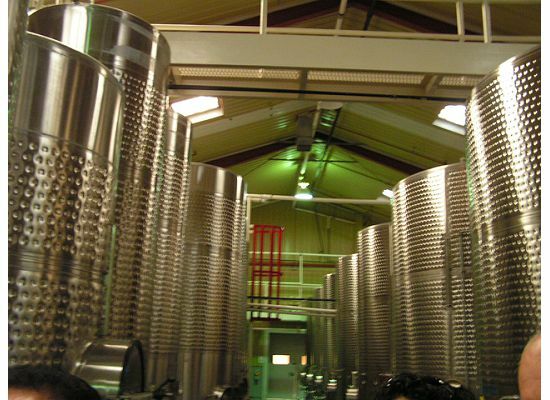 At an International Wine Competition in U.K. in 2003, it was awarded "The Best US Wine Producer" award. 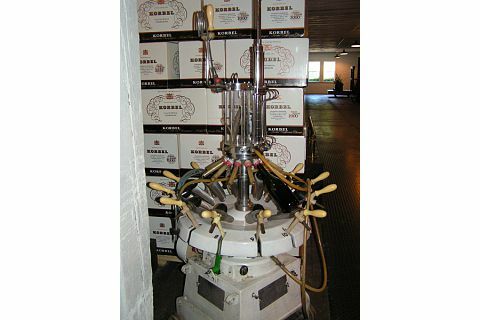 It was awarded for the consistent high quality of wine in several kinds of wine and its advanced techniques for years. 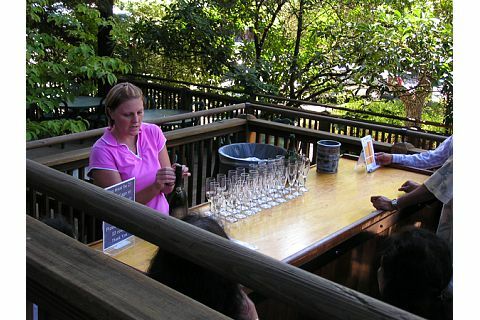 When we visited the winery on 8/30/08, they were having "Sonoma County Wine Fair." 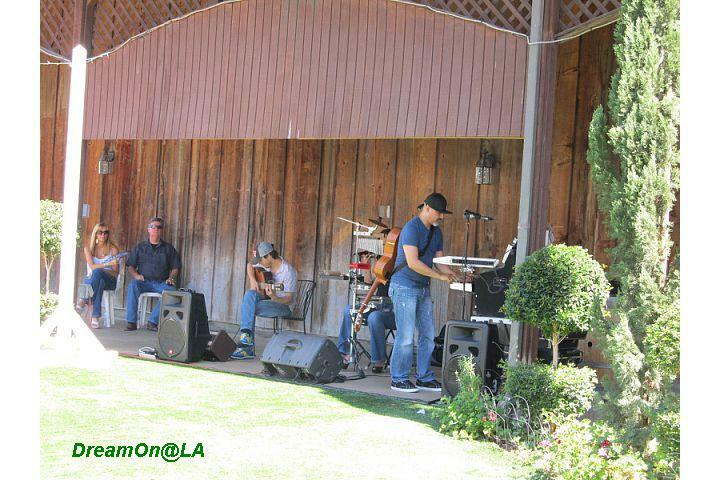 At several winery in Sonoma, there were events to enjoy wine, gourmet meals, and music for lunch or dinner. That day, they were serving BBQ luncheon at outside patio as well. We had to leave in a few minutes because we did not have time to stay. From 2 to 3 days ago, local TV channels have been reporting about "Wine excise tax increase" proposed by California Governor Arnold Schwarzenegger from 4 cents to 29.6 cents per 750 ml bottle. It is different from sales taxes. 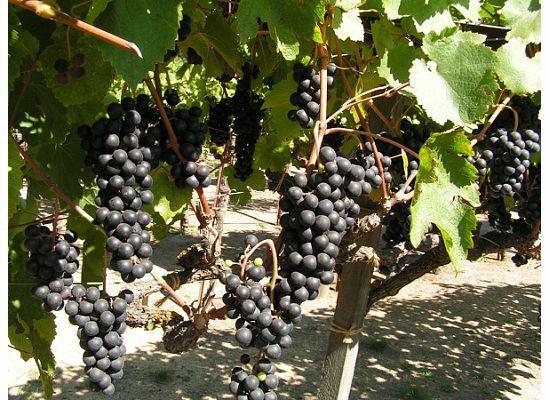 The wine makers will pay to the government up front, but definitely the selling price will be increased. 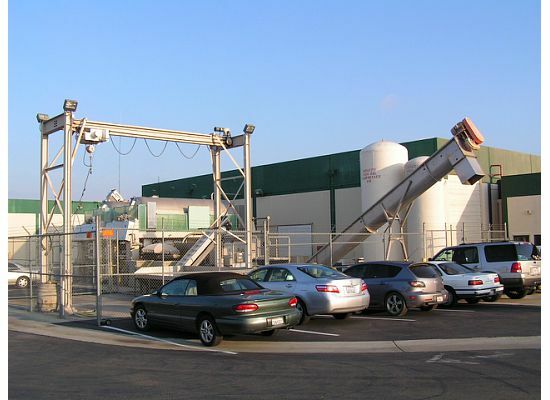 It is a part of Governor Schwarzenegger’s plan to close California’s $41.6 billion budget gap. 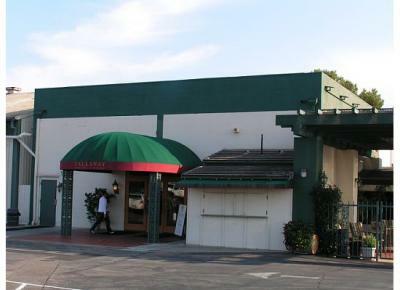 Trader Joe’s, which introduced the $2 wine seven years ago and has never raised the price. 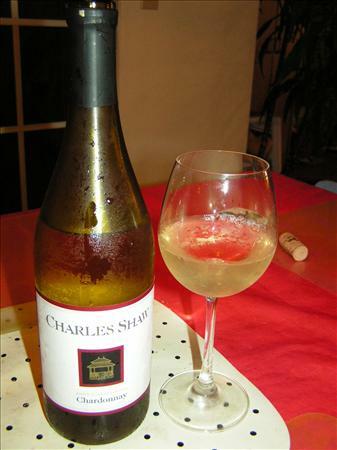 "'Two Buck Chuck' could be increased to $2.50 or $3 per bottle"is a talk of the town now. 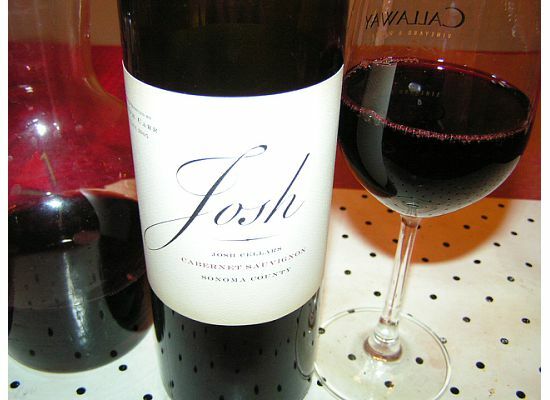 I will introduce Josh Cabernet Sauvignon 2005 wine that I tasted last night. 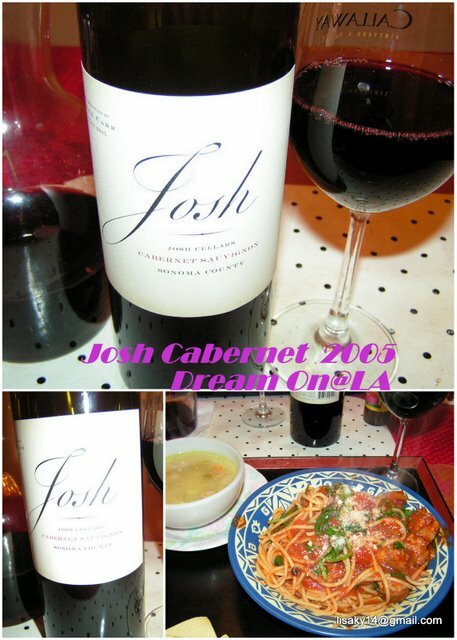 Joseph Carr has been called a “rising star” in Napa Valley, among some wine writers, and continues to make his mark as a fine wine producer. 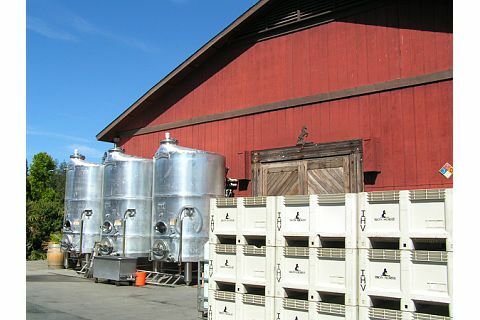 He launched his family owned company in 2005 in Sonoma, Northern California. 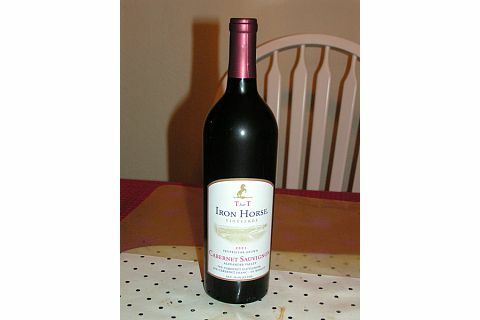 Ken's Wine Guide site (www.KensWineGuide.com) mentioned this wine as "Recently Discovered Tasty and Affordable Wine." The price is probably around $18. A wine loving friend gave this to me as a gift two months ago. 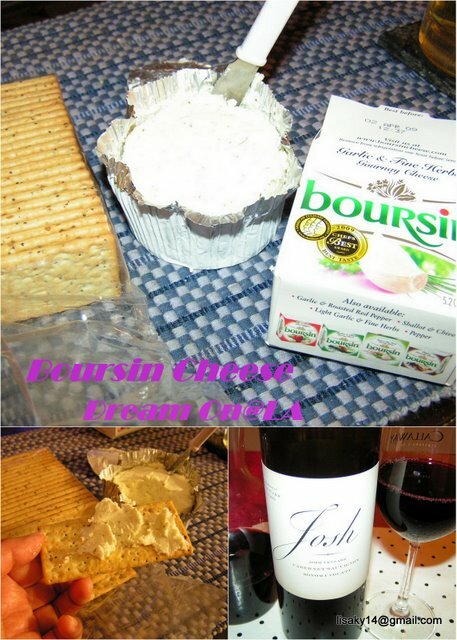 This wine goes well with "Boursin Garlc and Herb Cheese" made in France. He began his career in the wine industry in 1980 while a Fine Arts student at Geneseo State University, working as a wine steward in a fine French restaurant. Mr. Carr went on to become a Sommelier for Hyatt Regency Hotels in Tampa, Florida, and eventually was named Wine Director for the Sagamore Hotel in Bolton Landing, NY. 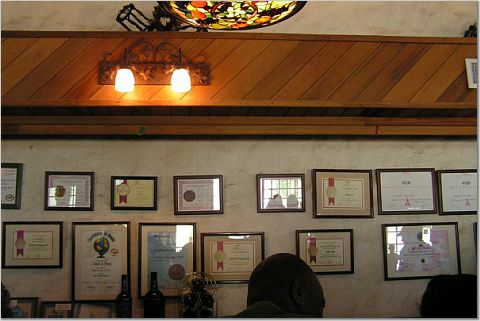 It was there, where he won the Wine Spectator Award of Excellence for his wine list design, and was featured in Restaurant Wine Magazine. 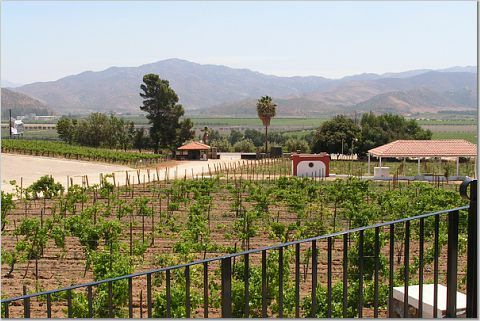 Joseph went on to a career in the corporate wine industry, working with several California wineries including: Freemark Abbey, Rochioli, and Markham, all while employed by Paterno Imports. I searched Internet for one hour, but I could not find any review of this wine in Japanese and there were a few reviews in English. This wine will be known to many wine lovers pretty soon. 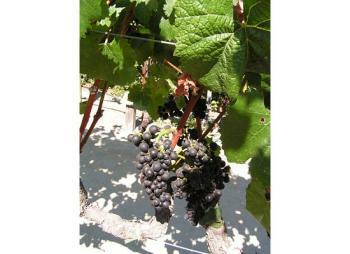 This complex, Bordeaux-style blend, bursts with ripe fruit flavors. 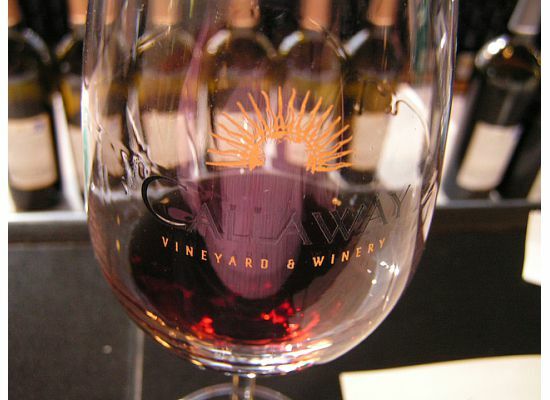 Black currant, spicy bramble berry fruit, with a hint of cocoa and smoke are the back drop of soft, approachable tannins. Appellation:Sonoma County, includes North Coast Vineyard sites in Sonoma, Dry Creek, Carneros, Russian River and Alexander Valley. A friend came on Friday, 1/9/2009, and we had Cheese Fondue for dinner. 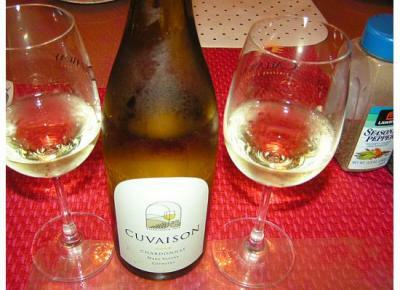 For the wine, we chose "2006 Cuvaison Chardonnay Wine, Carneros" that another friend gave me on a New Year's Day. 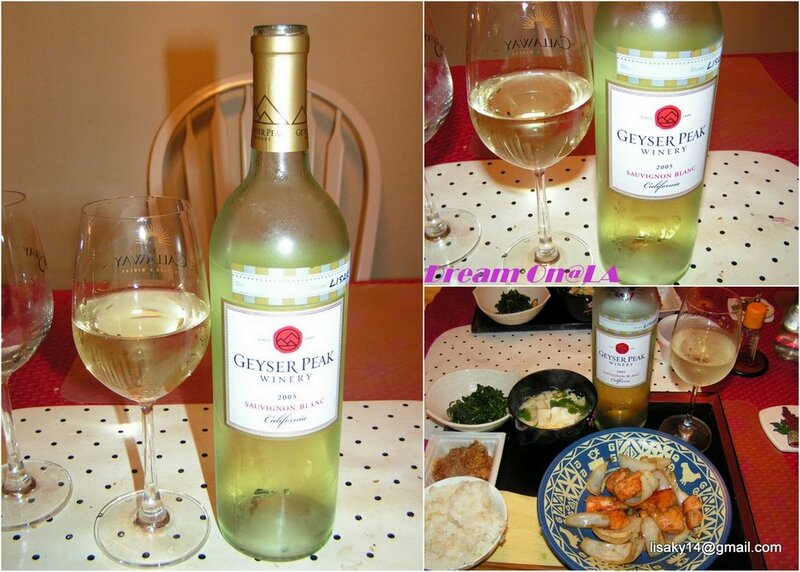 I did not know about this wine and tried this for the first time. It was pretty good. According to Japanese Rakuten Select Shopping site, Cuvaison Winery has become one of the prestigious winery to represent Napa Valley wine. 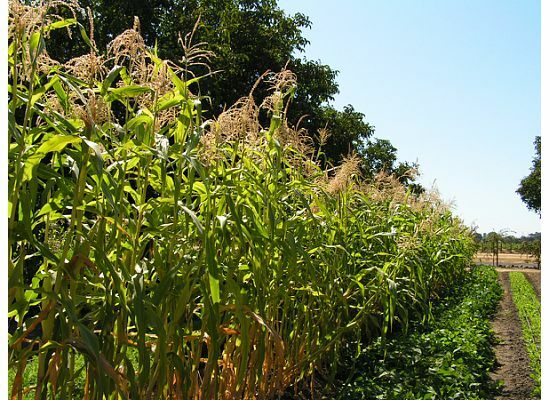 It is consumed in all 50 states in US. 20% wine produced at Cuvaison Winery is also consumed in 20 overseas countries in the world. It is also served in First Class on board of British Airways, China Air, and Cruise Lines such as Queen Elizabeth the 2nd. 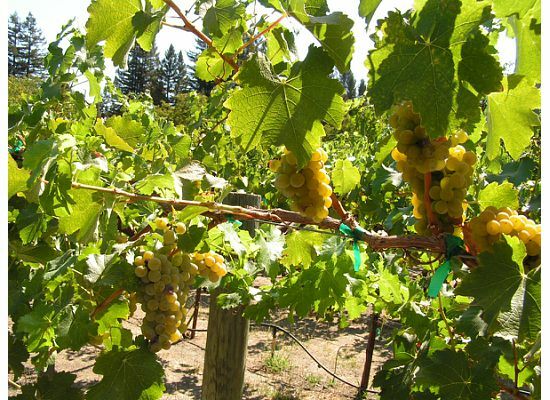 Chardonnay Carneros is served at White House dinner, and Chardonnay Reserve was served to the Pope during his U.S. visits. The wine was tasty. I would like to drink it again soon. 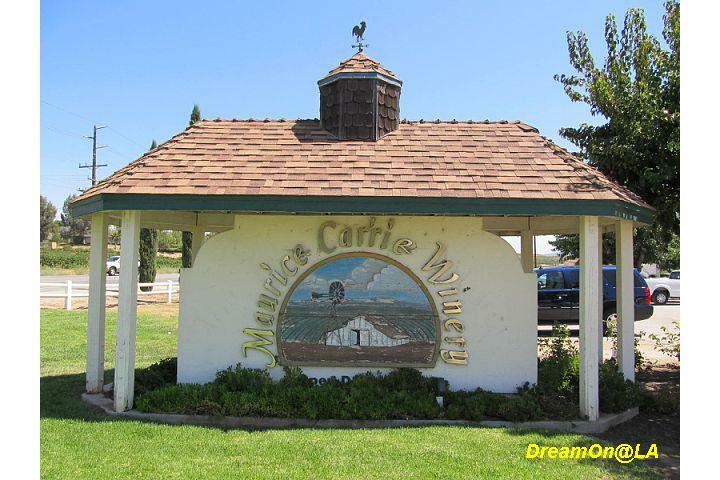 On 11/28/08, we visited Maurice Car'rie Winery in Temecula. 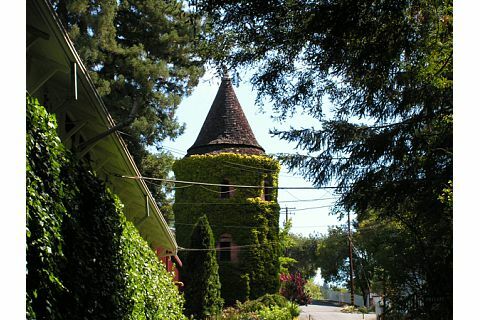 This Victorian-style winery was established in 1968. I have visited here several times for almost 10 years. Until the last visit, about 3 years ago, the wine tasting was free. Currently it's $10 for 6 kinds of wine with a glass with a logo to keep. 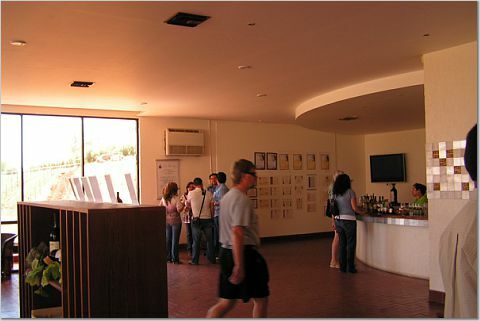 The wine tasting bar was crowded, although it was no longer free. Freshly Baked Sourdough Bread is Great! It is baked fresh on site every hour. 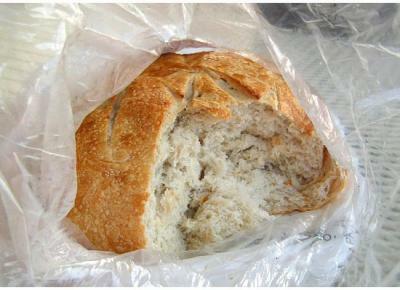 It is sold for $4 per 1 pound (450 gram) size sourdough bread. 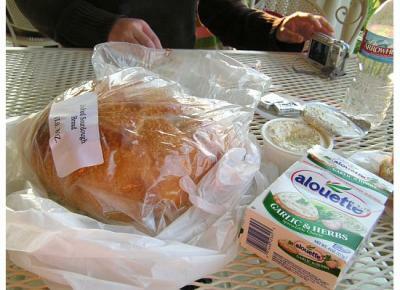 We bought one freshly baked and steamy hot sourdough bread and ate it at the patio table. At the winery they sell garlic & herb cheese spread, several kinds of cheese, butter, and a set of 2 plastic knives, 4 paper napkins, and 4 small butter slices at $1. 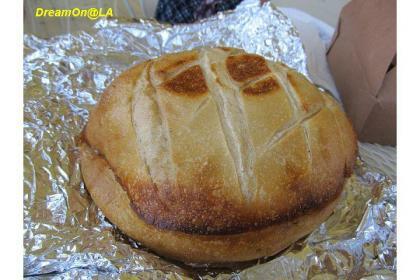 They also bake sourdough bread with brie cheese inside with pre-paid orders and 30 to 60 minute wait for a higher price. I never had that kind since I didn't want to wait. Sourdough breads are baked every 15 to 30 miuntes and placed in a large basket at the winery for sale. 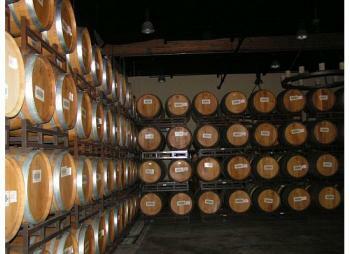 I call this winery, "bakery". 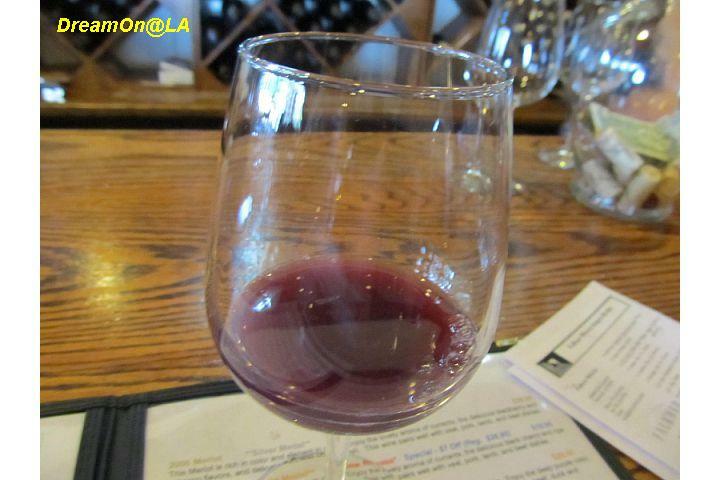 After eating freshly baked hot sourdough bread, it's time for wine tasting. 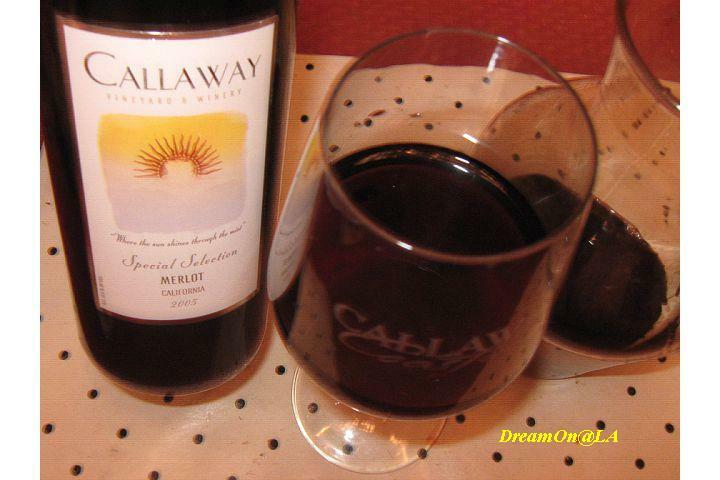 We brought the 2-for-1 coupon that I mentioned in the previous "Callaway Winery" blog. So it was $10 for two of us for 6 kinds of wine with the wine glasses. 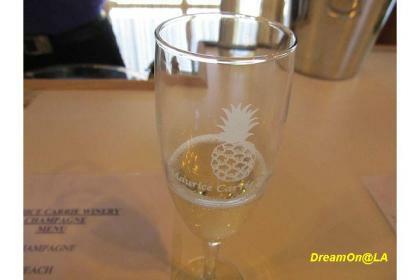 1) Pineapple Champagne $12.95, refreshing, light, and tasty. 4) 2006 Riesling $14.95 Gold Medal , slightly sweet and smooth. 6) 2005 Saugiovese (dry and fruity) $18.95 Gold Medal, medium-bodied and dry. 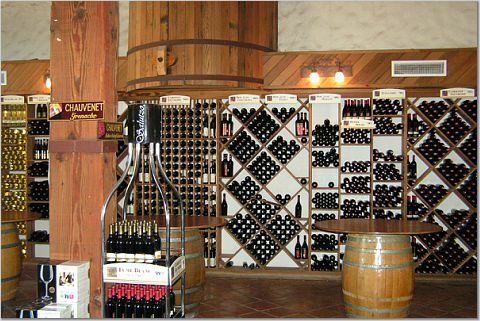 If you become a member of the wine club here, you can get wines at 20% off, wine by cases at 30% off and merchandises at the winery at 10% off. 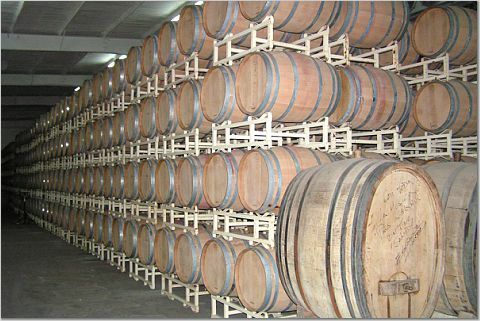 Selected wines are shipped every other months. You can choose to received 3, 6, or 12 bottles. 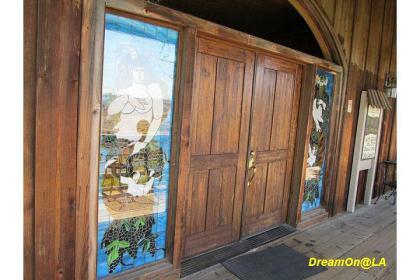 There are merchant booths for purses, accessories, paintings, and etc. 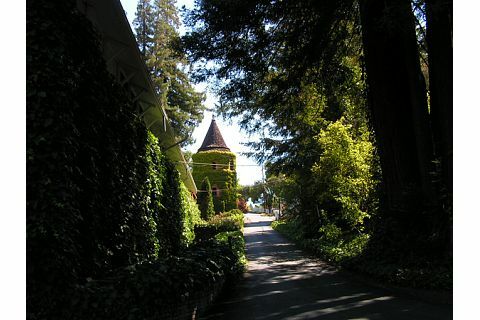 in front of the winery. 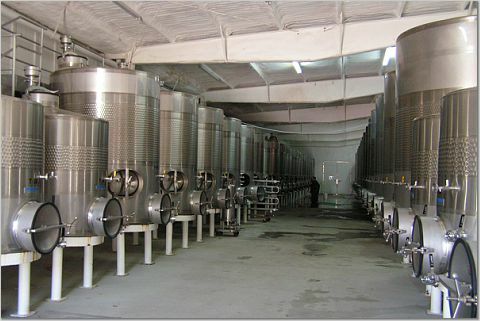 This winery is always crowded and fun-field. I missed to see the cats in the front yard this time. 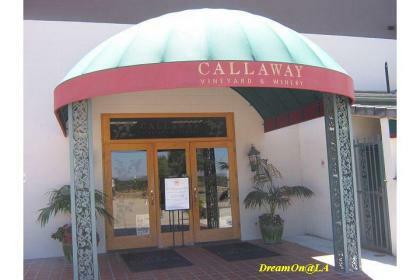 On Friday, 11/28/08, I visited Callaway Winery in Temecula for the first time in 3 years. I picked up friend C around 11:30 AM near UCLA and got into a traffic jam on 405 Free Way Southbound around Washington Blvd.for 30 minutes due to a prior accident. We reached Callawy Winery in Temecula around 2:20 PM. 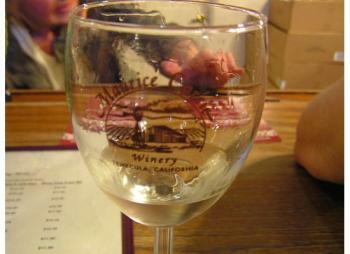 We ate sushi we brought at the parking lot and went to get wine tasting! Since I brought 2-for-1 coupon for wine tasting, it was $10 for 2 of us to get the tasting with a signature logo glass each. 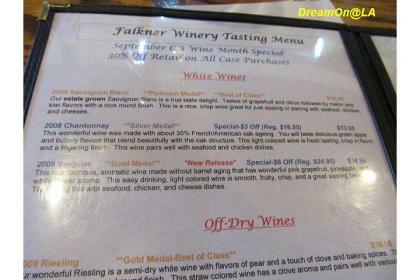 We could select 6 from 21 kinds of wine at the tasting. 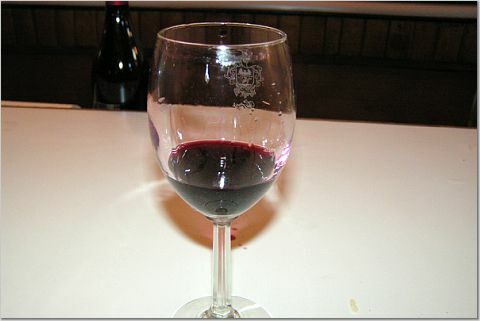 Here it goes for "wine tasting". 67% Chardonnay, 25% Semillon, 8% Vionier. The last winery tour of the day was to start from 3 PM. After tasting, it became about time, so we went out and waited near the winery entrance. A tour guide lady came, and the winery tour started. There were about 40 participants. 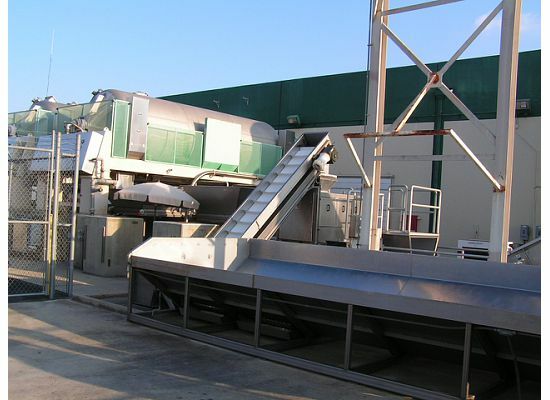 Grape harvests are picked by hands at night in September and October, because the temperature varies extremely in a day and it is too hot in daytime. To keep moisture in grapes and to maintain worker's stamina, they work at night. 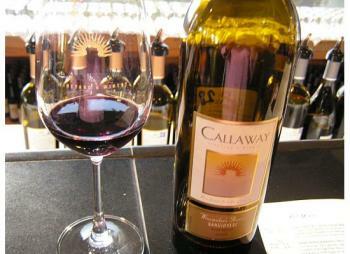 Callaway Winery was founded in 1969 by Ely Callaway, who went on to gain fame and fortune in the world of golf. Extensive research led Mr. Callaway to Temecula and to veteran viticulturist John Moramarco who believed that the area was ideal for growing premium wine grapes. On July 9, 1976, Her Majesty, Queen Elizabeth II toasted the President of the United States at a luncheon in New York City. The only wine served at this bicentennial event was Callaway's estate bottled 1974 White Riesling produced by Callaway Winery. Her Majesty, not known to be a wine drinker, requested a second glass! 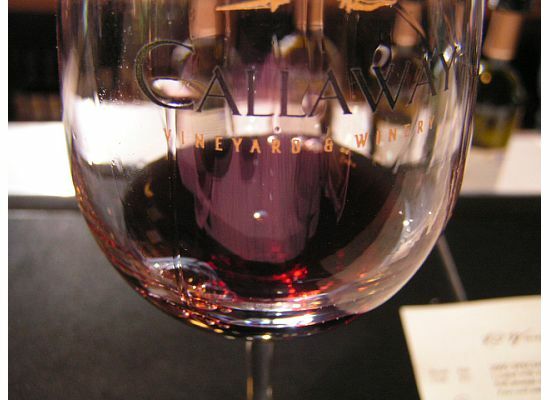 Then, Callawy wine became famous. Privately owned, Callaway Vineyard & Winery was purchased by the Lin family of San Diego upon the dissolution of industry leader, Allied Domecq Wines, in late 2005. Callaway Vineyard & Winery wines are only available at the winery and are not available in any retail. 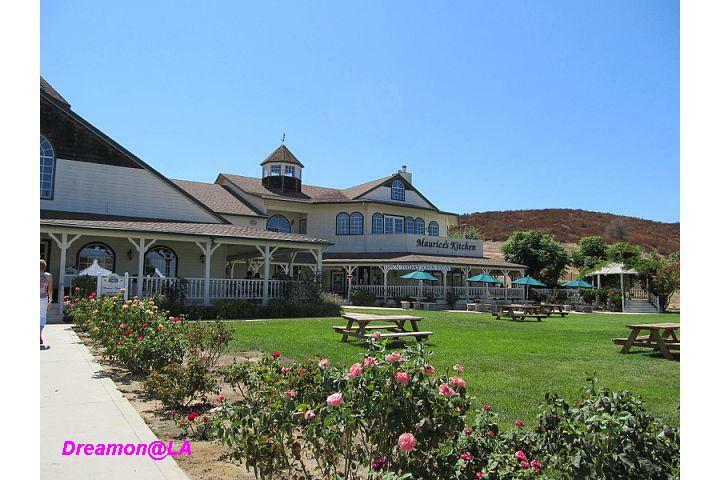 I introduce you to Kendall-Jackson Winery that I mentioned last week in my blog. I visited here on 8/30/08. 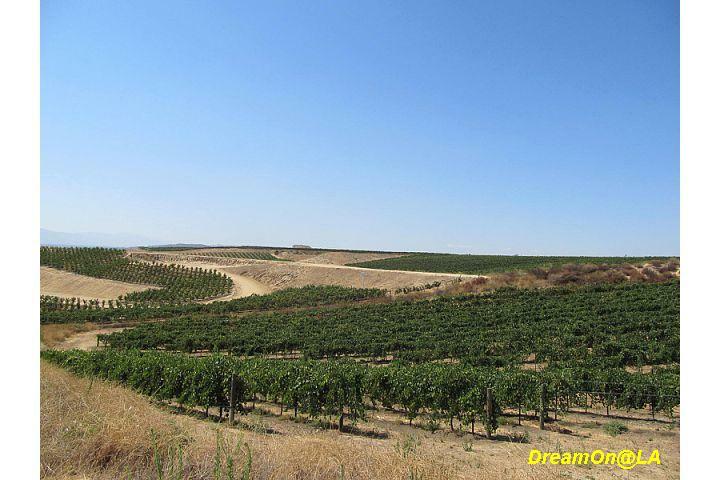 It is located little north of Santa Rosa in Sonoma, in nothern California. 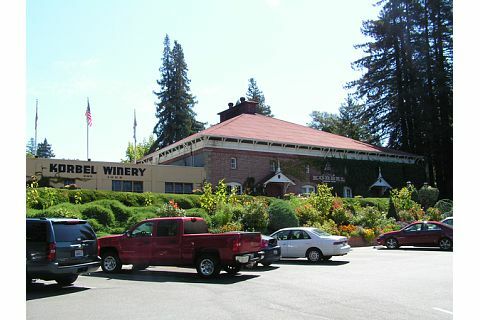 Kendall-Jackson Winery (KJW) became one of the wineries to represent California winery, such as Robert Mondavi, Bellinger, and Gallo in 25 plus years after it was founded. 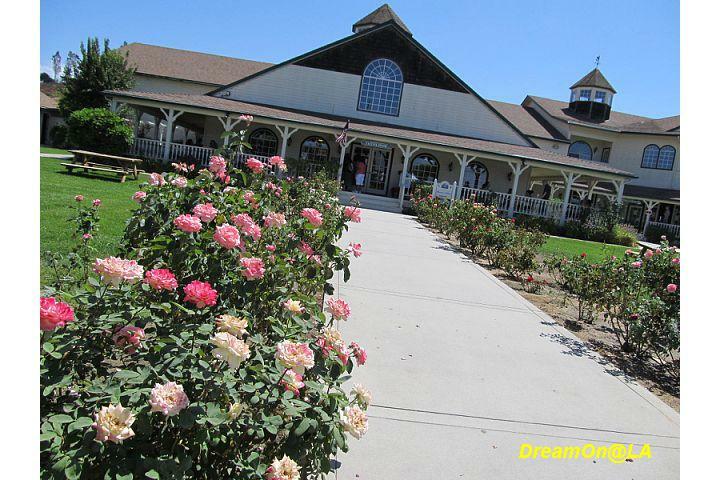 They offer wine tastings and garden tours at beautiful Kendall-Jackson Wine Center. 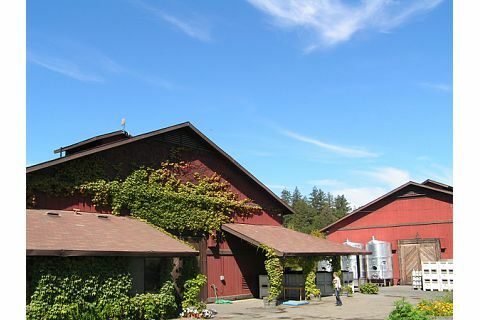 This winery was selected as "the most awarded U.S. winery in 1990's". 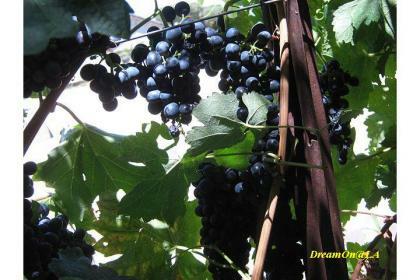 In the garden, there are samples of nearly 100 grape-vines with name plates. Good for self-study. 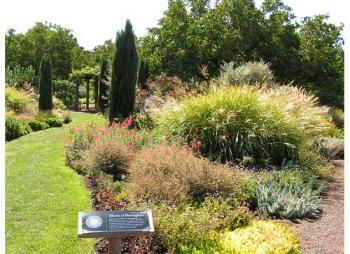 In the back there was an International garden with plants gathered from all over the world. Also this wine center offers tasting of wine matched with appetizers. There are natural organic vegetables grown in the garden. Sun Flower. They might be used for seeds and oil? 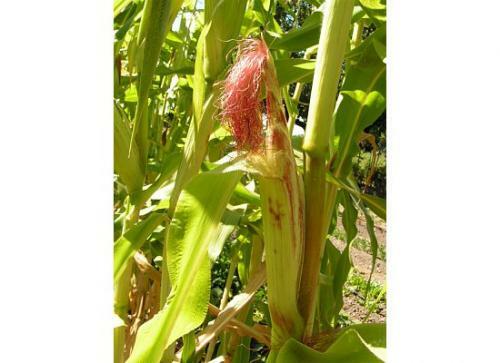 Close-up photo of a Corn. It looks delicious. 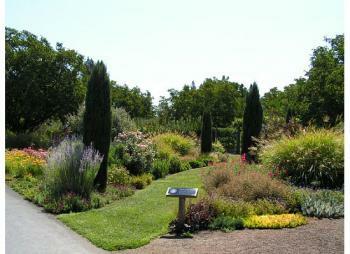 There were Lavender, Sage, Mint, Rose Mary, and lots of other herbs. There were lots of people at tasting bar, so we did not try tasting there, knowing their wines are sold at most of the large supermarket outlets. 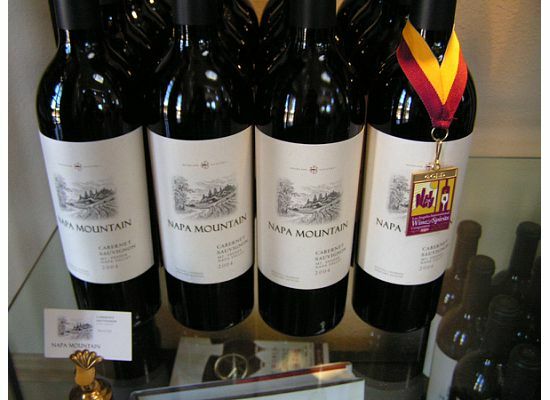 I took photos of two wines wearing lots of gold medal ribbons. 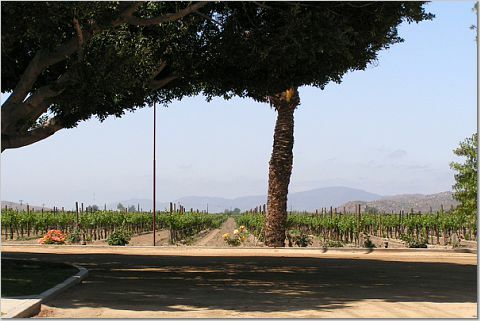 2004, Santa Barbara, 90 points. Many of KJ's white wines as well as red wines seem to be good. KJ's 2004 Chardonay Reserve is proud to be the best U.S. chardonay wine for 13 years in a row. 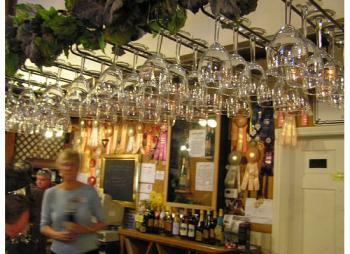 Inside KJ Wine Center. Wine tastings are being done. 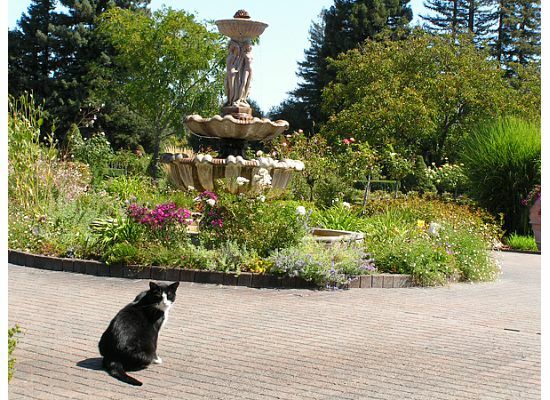 The garden is maintained very well in details. This cat looks relaxed. 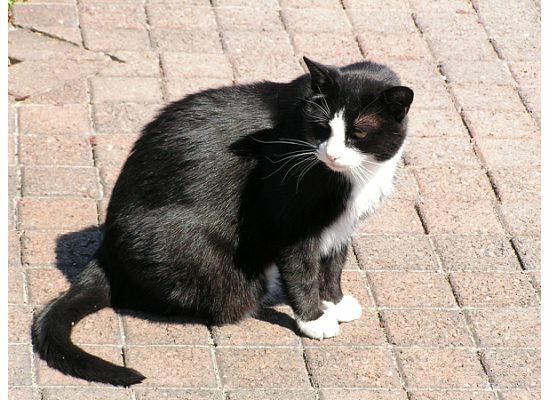 This cat must be living at Kendall-Jackson Wine Center as a pet. This place can be enjoyed for a garden tour, too, and it was very nice. I wish they also open a cafe or restaurant to serve brunch and lunch. 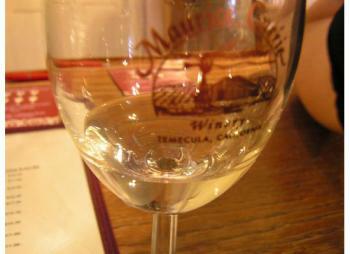 They served appetizers for wine tasting, but the portion was very little. 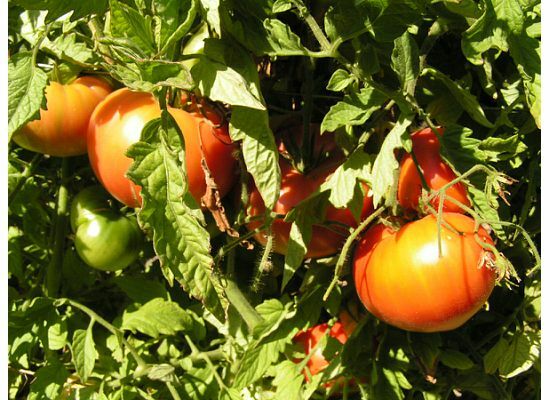 Their culinary dishes using organic vegetables looked delicious. 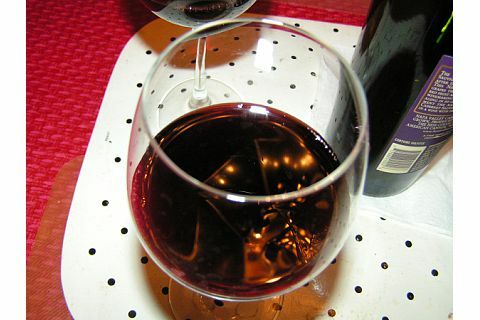 It was "Beaujolais Nouveau Day" on 11/20/08. It is released every 3rd Thursday of November. Compared to Japan's bubble days around 1990, you don't see much advertisements and news on it, but there were some talks about it. We opened a bottle of a special wine we purchased in Napa Valley when we visited at end of August. It is Robert Mondavi Napa Valley 2005 Cabernet Sauvignon wine. $28. 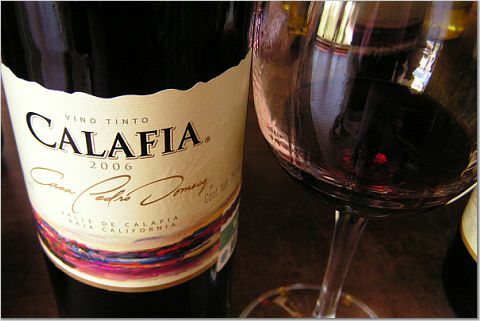 Deep and dense with perfumed aromas and delicious flavors of blackberry, cassis, black olive and dark chocolate. 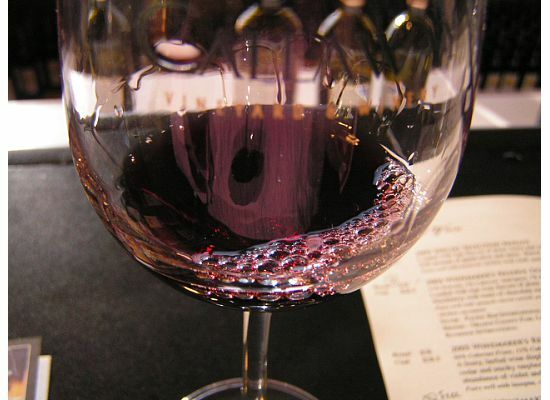 Smooth and supple, with fine-grained tannins, good acid and a lengthy finish. 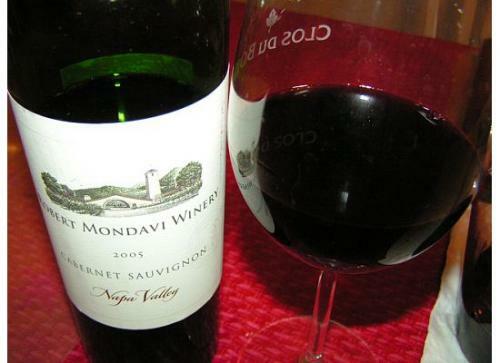 Robert Mondavi Cabernet Sauvignon wine went well with deep-fried Pork Filet Cutlet. 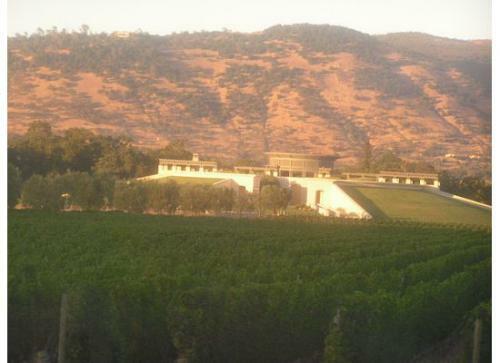 Robert Mondavi passed away last May at age of 94. 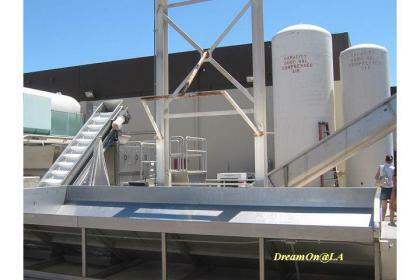 The photo above is a photo of "Opus One Winery" built as a joint venture. 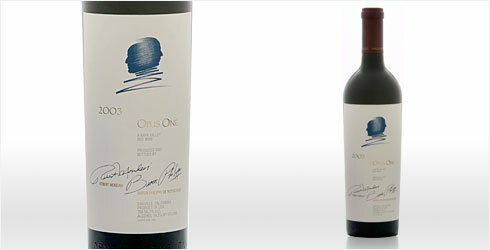 He and the Baron Philippe de Rothschild of Château Mouton Rothschild created Opus One Winery in 1979. First year after it was created, it was sold at $50 a bottle. Now it is sold around $200 or more. I prefer this Robert Mondavi 2005 Napa Cabernet Sauvignon rather than Opus One wine. 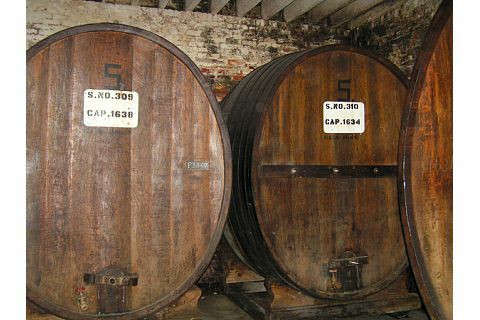 Maybe the production year I tasted (1996 version) was not that good or the way we stored for 3 years was not adequate. Robert Mondavi said, "Wine Making is Art and Culture." He supported all sorts of activities of Art, Culture, and Medicine, and he had been praised with those. That was the night I enjoyed his wine culture and art. 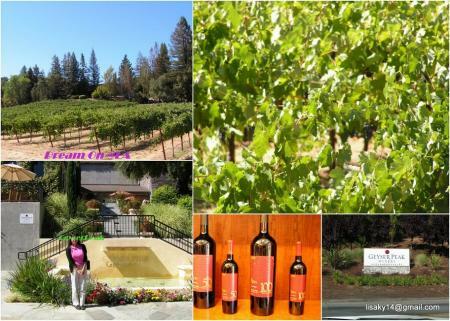 I still have lots of photos and episodes from my last 4 day trip to Napa Valley, Alexander Valley, and Sonoma in end of August. Little by little, I will introduce some of them on this blog again. 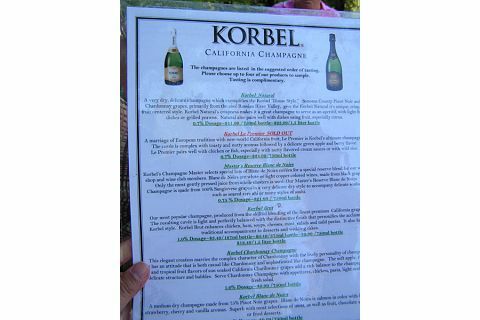 We went to Korbel Champagne Cellars on August 29, 2008. They are famous for champagne. It was founded in 1882 by Francis Korbel. He was from a small village in southern Bohemia, which today is the western Czech Republic. He called two brothers from his home town to help his business. It was started as a lumber merchant. 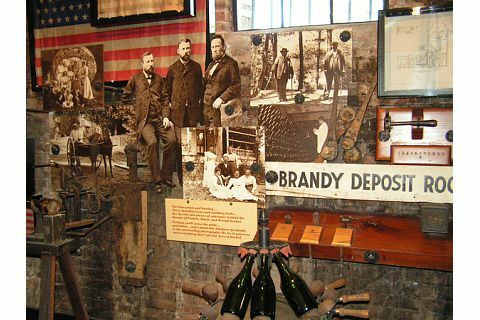 Then, the business spread to cigar-making, brandy, and champagne. A railroad was constructed in order to ship out lumbers. 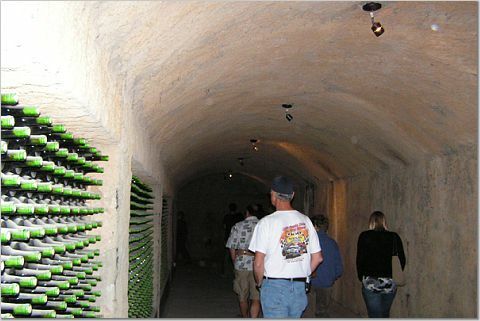 There is a still a part of the railroad and a train station in Korbel Champagne Cellars. There is a silo tower to store tobacco, still standing in that property. 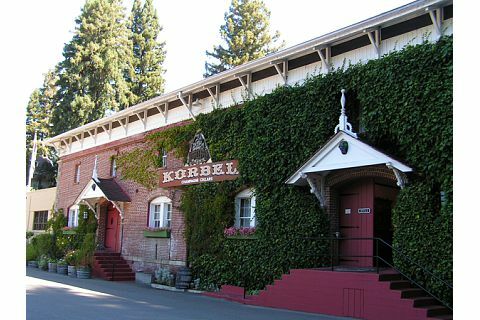 Later years, Korbel pulled out from cigar and lumber business. It has been the exclusive champagne of the past five presidential inaugurations, and was the champagne of choice for the Camelot years of the Kennedy administration. 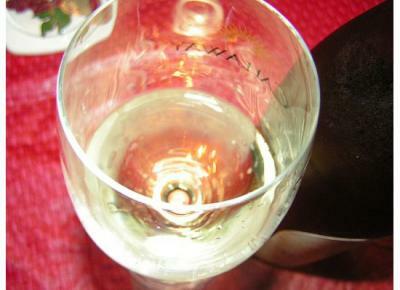 I guess it's possible that Marilyn Moroe tasted this champagne. 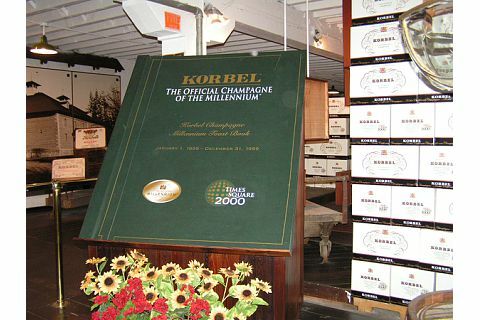 Korbel has been a supporter and licensee of the 1996 Olympic Games, an Official Supporter of the 2000, 2002 and 2004 U.S. Olympic Teams and the 2002 Olympic and Paralympic Winter Games, and the first global sponsor of Times Square 2000. 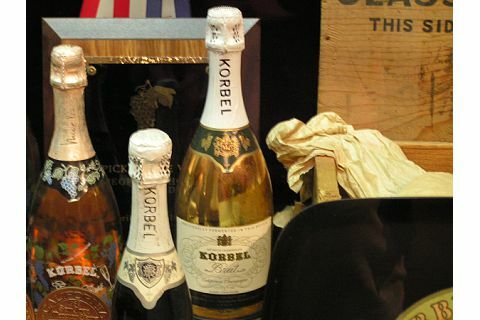 Korbel is the number one selling premium methode champenoise-produced champagne in America. 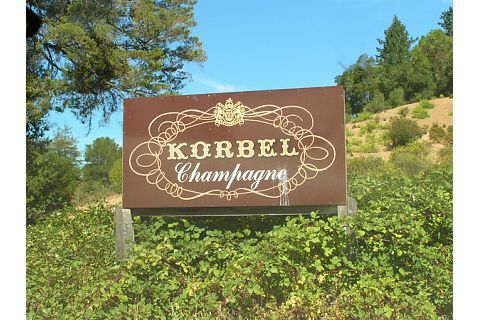 This champagne cellar started by three Korbel brothers was sold in 1954 with a condition that "the name Korbel will be used" and "the same premium champagne producing method should be used." 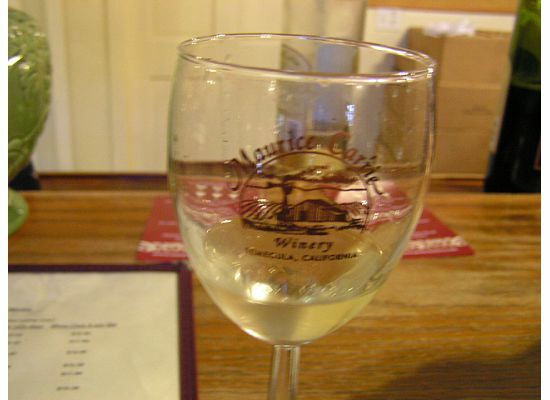 They offer a free 45 minute winery tour every hour, and there will be a free tasting. 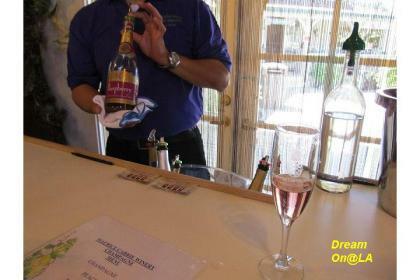 You can skip the winery tour, and get a free wine/champagne tasting at the tasting bar as well. There is a delicatessen and a patio. You can enjoy food there, too. Korbel Bruit Rose champagne was unique and delicious, so I bought it there. It contains Pinot Noir. No wonder, it tastes good. 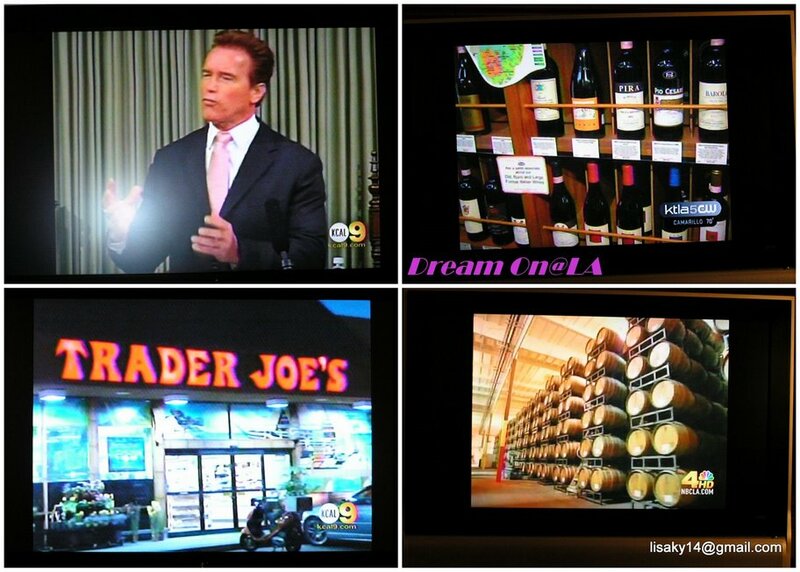 You will find Korbel Bruit, Korbel Extra Dry Bruit champagne at super-markets, liquor stores, and Costco store all over the United States. 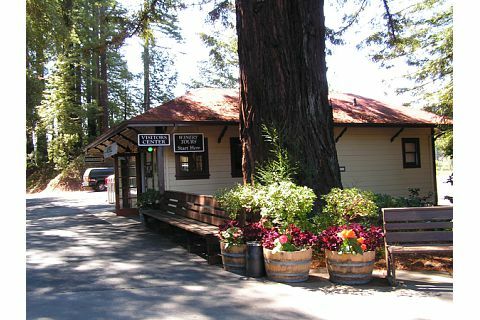 The Visitor Center. A winery tour starts from here. 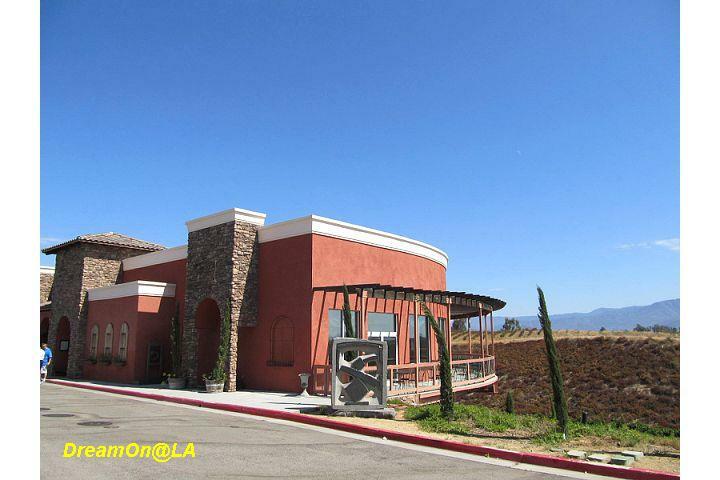 This used to be a railload train station. A display in the Gallery. The left side is a picture of three Korbel brothers. 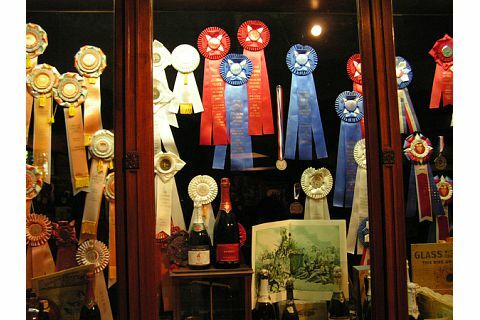 A display of medals and awards Korbel received through the years. 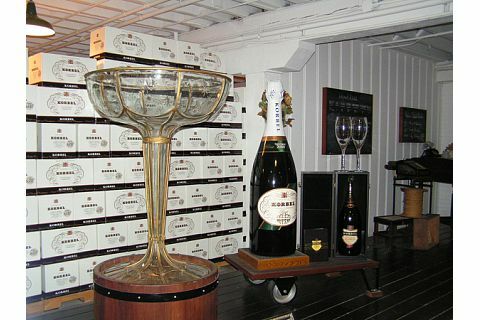 This gold bottle was made to celebrate the one million case of champagne production. I heard the bottle is very precious. 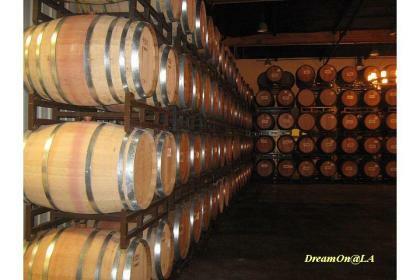 We were escorted to inside the building where they store champagne oak barrels. 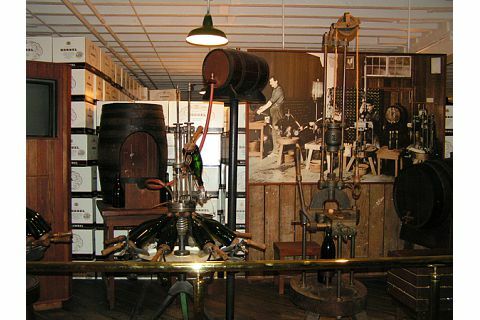 This is a display to show a part of their old champagne production line. 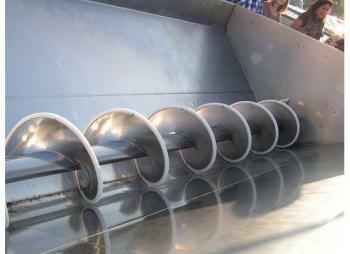 A large champagne glass and bottle were used at New York Times Square, for a countdown of a new Millenium for year 2000. 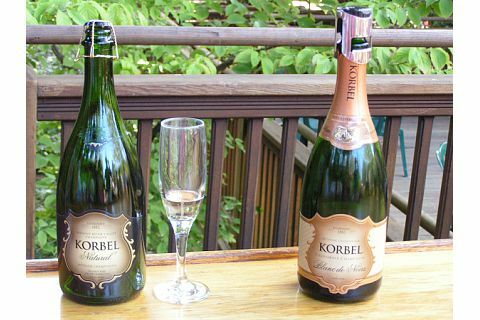 The modern line up of Korbel champagne and Korbel Brandy. Nice bubbles... 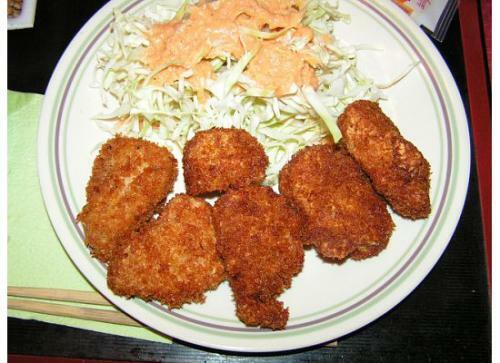 It is chilled cold and looks good! Nihon Blog Village Los Angeles Info. 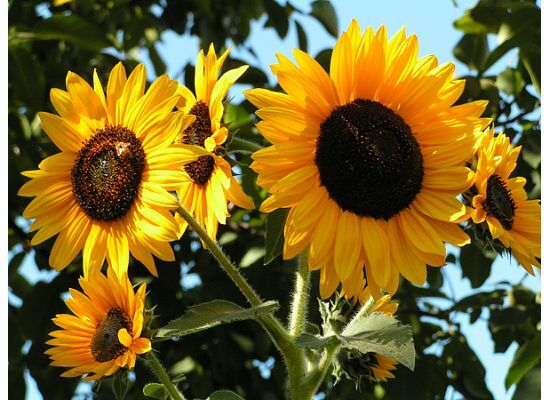 I am a member of blog ranking in Japan. 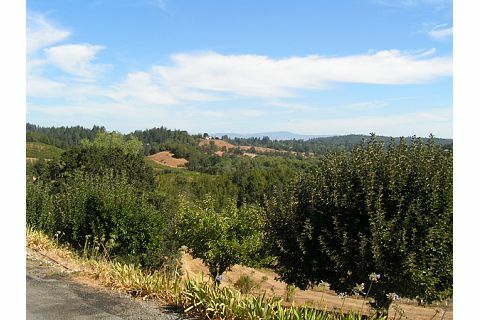 On the private road to Iron Horse Vineyards. It continues for a few miles. 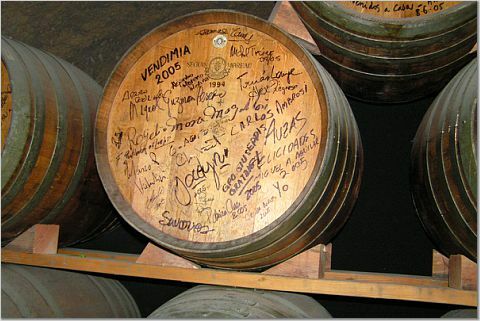 The Wine of Presidents, Kings, Queens...and Now the Pope. We visited Iron Horse Ranch and Vineyards on Friday, August 29, 2008 around 10:30 AM. 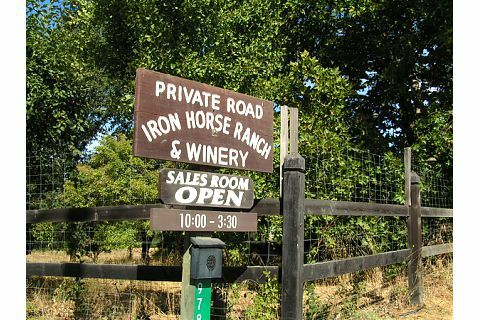 Iron Horse is located in Green Valley in the coolest, foggiest part of the Russian River Valley, just 13 miles from the Pacific as the crow flies. 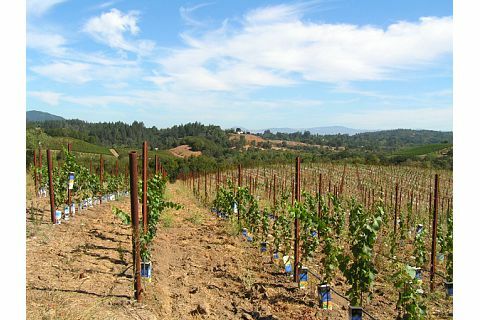 There are approximately 160 acres in vine, planted exclusively to Chardonnay and Pinot Noir. 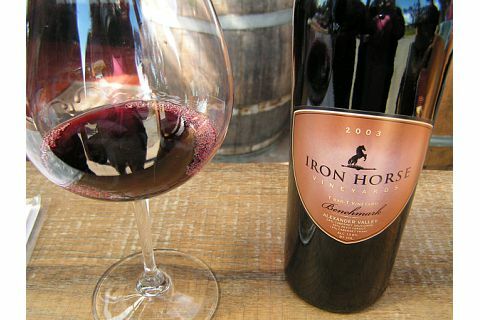 Iron Horse is a marriage of two vineyards: the Sterling family estate in Sonoma County's cool, foggy Green Valley and son-in-law Forrest Tancer's T-bar-T Ranch in the Alexander Valley. The winery is best known for its Sparkling Wines, which have been served at the White House for four consecutive presidential administrations. 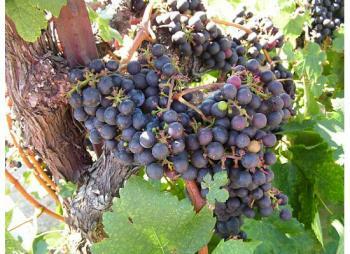 Pinot Noir is the winery's rising star wine. One of its most highly allocated releases is the Cabernet Sauvignon from T-bar-T. 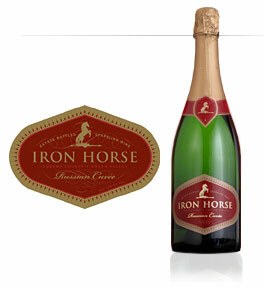 The Iron Horse name comes from a passenger train that passed through the Green Valley in 1905. 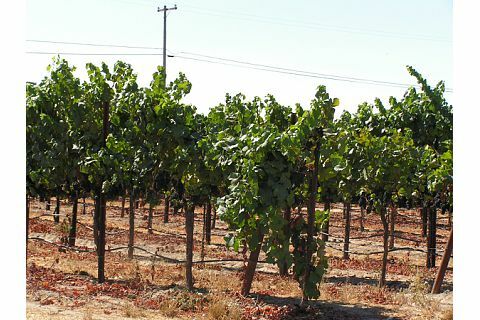 Forrest Tancer planted the core 110 acres at Iron Horse in 1970 when he was working for Rodney Strong Winery. 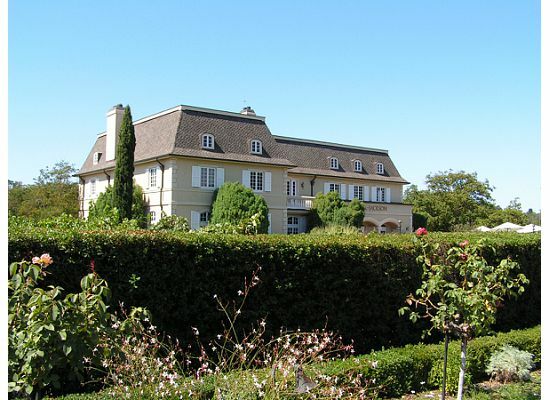 Audrey and Barry Sterling bought the vineyard in 1976 and partnered with Forrest to build the winery. Forrest and the Sterling's daughter Joy were married in 1990. 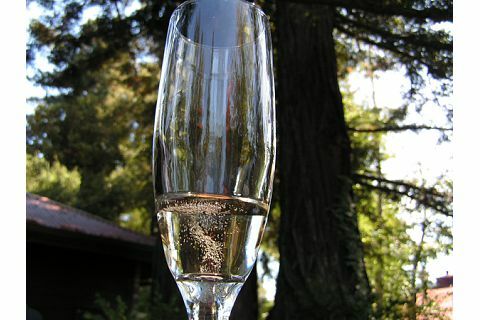 The Wedding Cuvee was originally designed for Joy and Forrest's wedding and this elegant sparkling wine is still produced today. It was toasted for Jenna Bush's wedding on May 10th, 2008, for the daughter of president George W. Bush. Vineyards along the private road to Iron Horse Winery. Iron Horse has now been served at the White house for four consecutive presidential administrations, beginning in 1985 with the historic Reagan/Gorbachev Summit Meetings, which ended the Cold War. 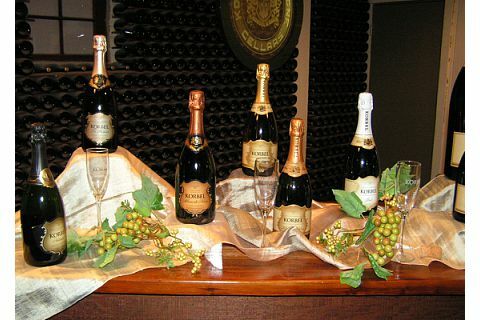 The first Bush administration served their Sparklings at several State Dinners and brought their Classic Vintage Brut to Moscow for the signing of the START treaty. 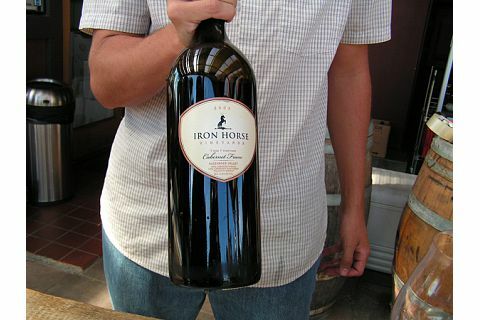 The Clintons chose Iron Horse for many occasions-most impressively for the offical White House Millenium Dinner New Year's Eve 1999 to toast the new Millennium. Iron Horse was served at the 200th anniversary of the White House attended by all of the living presidents except Ronald Reagan. He was too ill to travel at that time. It has been served to kings, queens, and the Pope on their visits to the White house. 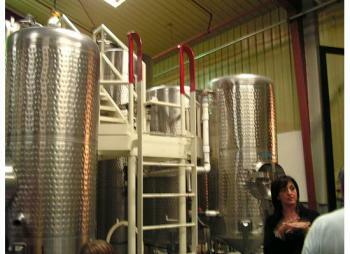 They offer a 30 minute wine tour from 10 AM on Monday to Friday by appointment. We called a day before, but it was fully booked. 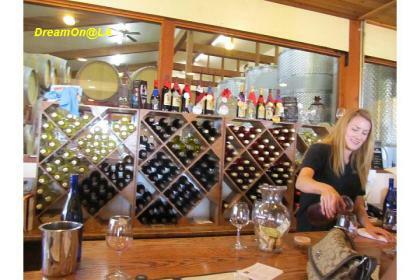 When we visited the winery around 10:30 AM, about 6 people started wine tasting after the wine tour. 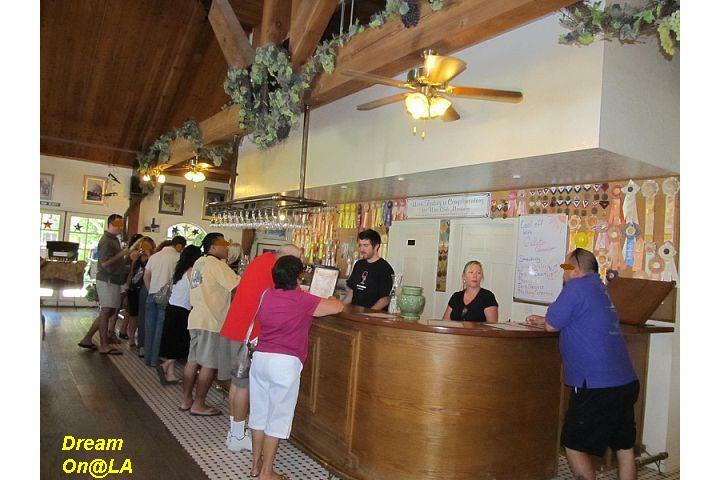 It seems the wine tour is limited to 6 people each day---very limited. 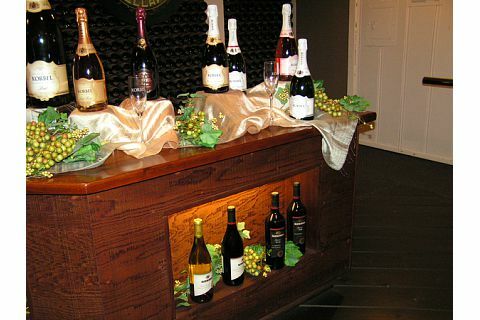 The wine tasting is $10 for Sparkling Flight (5 sparkling wine) and Seasonal Flight (5 still wine). It's $15 for Reserved Flight ( 5 reserved and rear wine ). 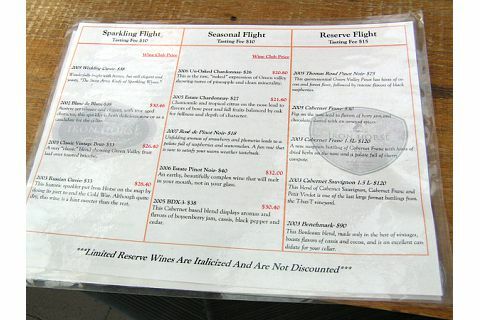 We tasted Reserved Flight. 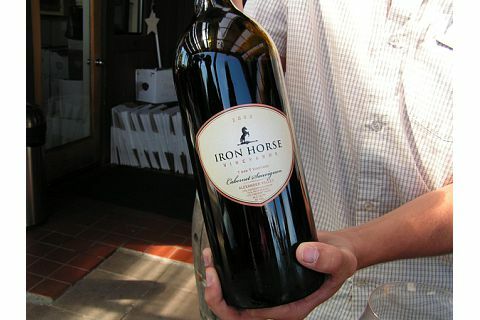 The reserved wine can only be purchased after you become a wine club member of Iron Horse Vineyards. 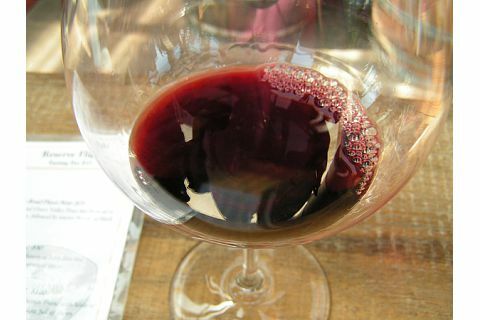 Among the 5 wine we tasted, we liked the 4th wine, 2003 Cabernet Sauvignon, T-bar-T Vineyrads, Alexander Valley, 1.5 Liter. It costs $120 per bottle. 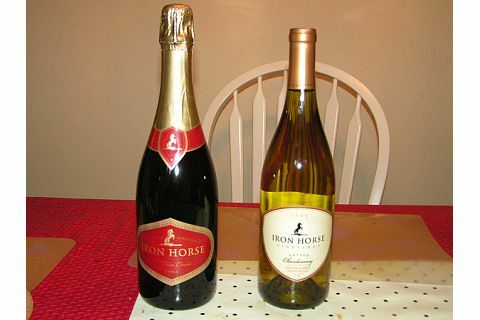 We purchased Iron Horse 2003 Estate Chardonnay and 2005 Russian Cuvee Sparkling wine, a bottle each. 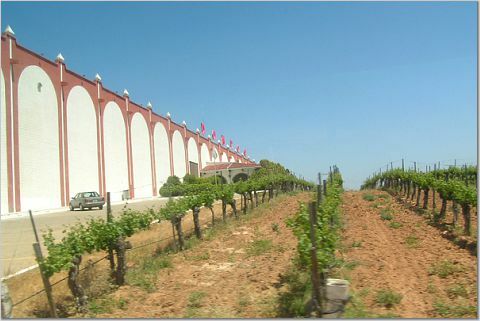 You need to go though a narrow private road for several miles to get to this winery, so commercial big buses cannot get there. You need to travel in a small to mid size car. 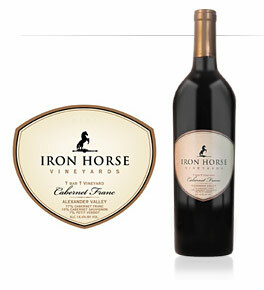 Lately it is extremely difficult to get Iron Horse T-bar-T Cabernet Sauvignon wine, but Iron Horse sparkling wine can be purchased on their website and other wine websites. 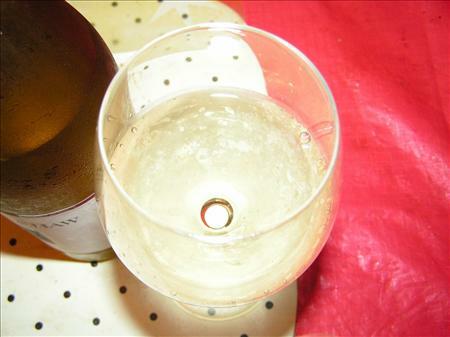 Actually their sparkling wine has been served at the state dinner at the White house. Cheers and enjoy their sparkling wine. It's around $33 per bottle. 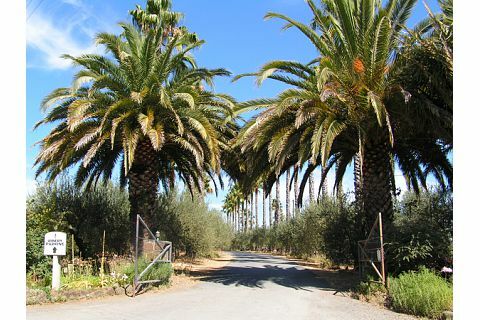 The winery is there after driving through the palm tree lined street. Several huge oak barrels were lined up around the entrance gate. 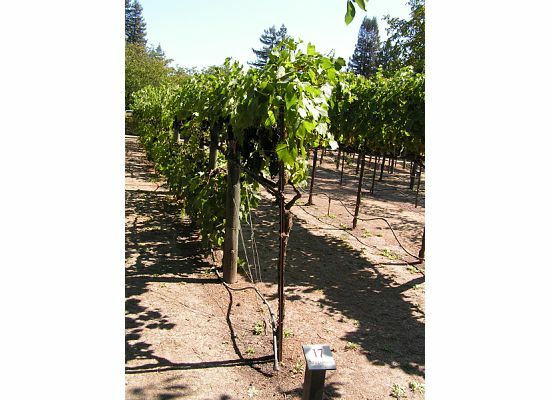 Grape-vines at the winery. 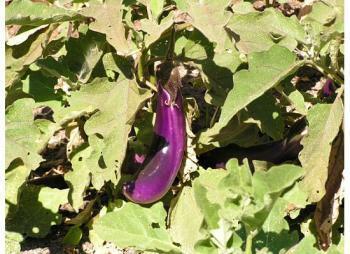 They are ripe little before harvest. They are probably Pinot Noir. The wine tasting list. Sparkling, Seasonal, and Reserved Flight, from left to right. We liked this wine the best. It's getting harder and harder to get this wine. 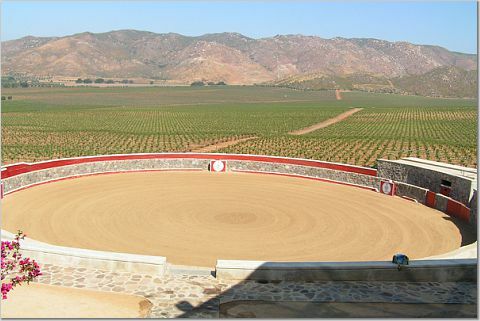 5) 2003 Benchamark T-bar-T Vineyard, Alexander Valley $90 blend of best of best. Wine testing labo. 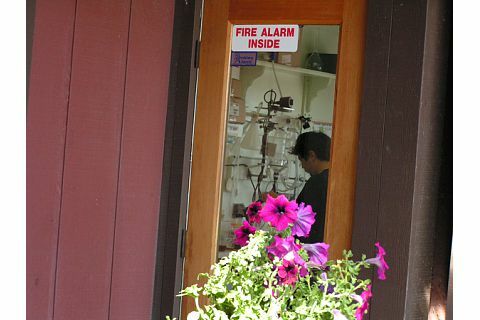 It was located at the wine tasting patio. A beautiful valley view from the wine tasting patio. 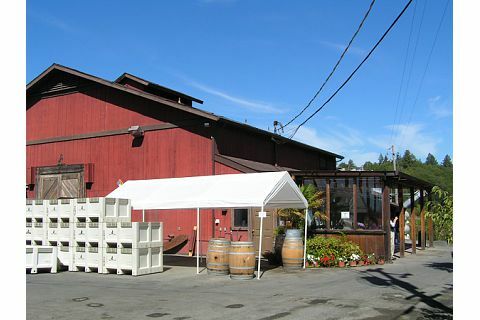 The wine tasting patio is located at the right side. This is a building for sales department. 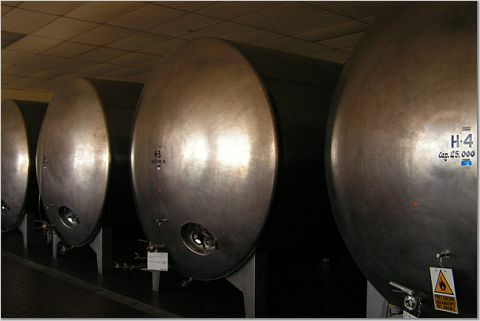 There are large aluminum wine barrels at the sales building. There was another building in front of it, but we could not enter. 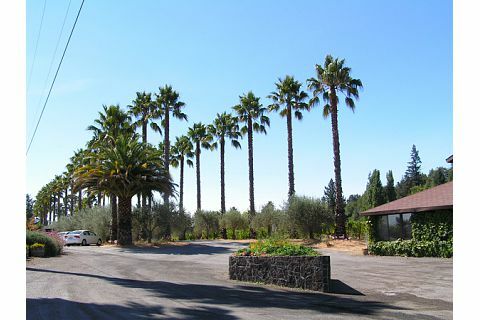 We bit a good-bye to the palm tree lined street, and we left Iron Horse Vineyard. 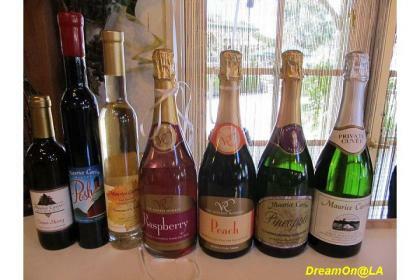 The wine we purchased---2005 Russian Cuvee Sparkling wine, 2003 Estate Chardonnay wine. 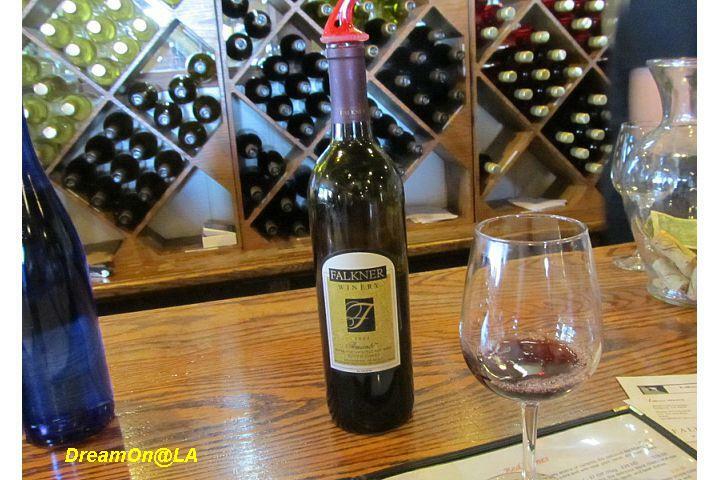 This is 2001 Iron Horse T-bar-T Alexander Valley Carbernet Sauvignon wine. I purchased it two or three years ago at $38. It's hard to find this wine now. 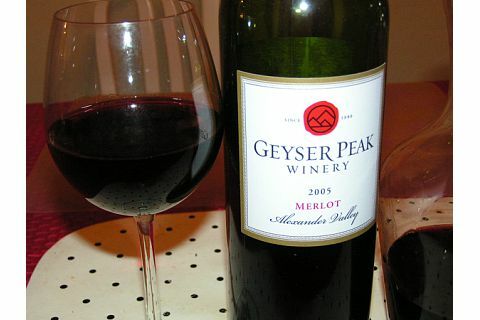 We tried Geyser Peak Alexander Valley 2005 Merlot wine three nights ago at a dinner. It was named "Best U.S Wine Producer" along with 5 Gold medals at The International Wine & Spirit Competition (IWSC), the premier competition of its kind in the world in October 2003 in London, U.K. 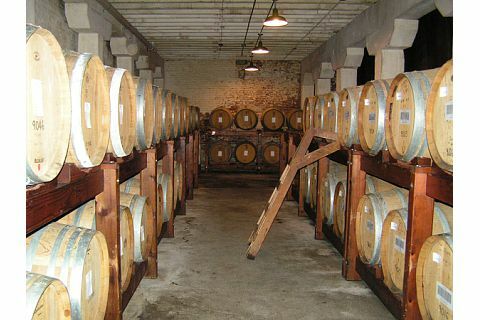 The "Best U.S.Wine Producer" title is one of a series of honors that IWSC bestows each year to comment the achievements of those companies or individuals who "set the standards of excellence for the rest of the industry to follow and [who] influence the quality, variety, value, and educational information available to the wine and spirit consumer, " according to IWSC. 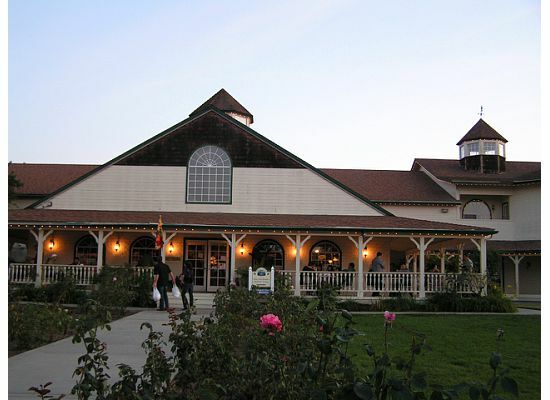 Founded in Alexander Valley in 1880, Geyser Peak Winery is one of the oldest wineries in its region. 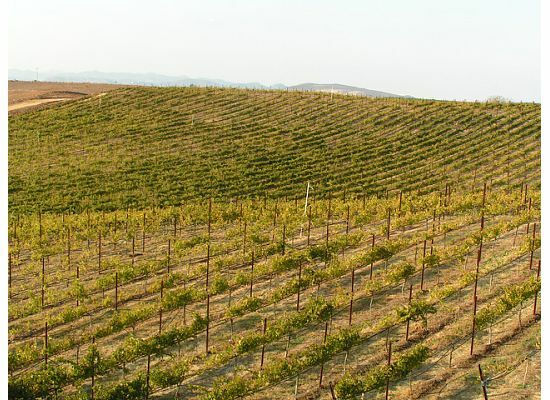 Remarkable in its diversity, Alexander Valley boasts an unusual mosaic of soil types, climates and topography. 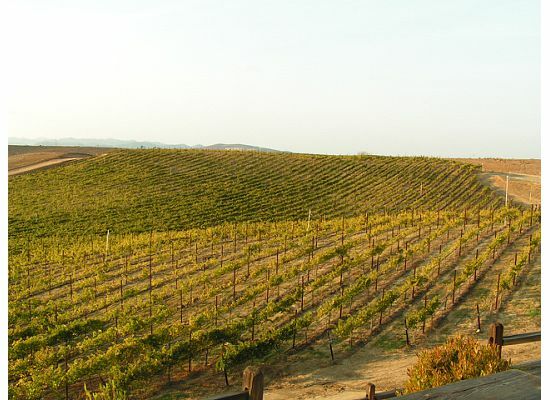 The Alexander valley is home to more than 40 wineries and located at the north end of Sonoma County, California. 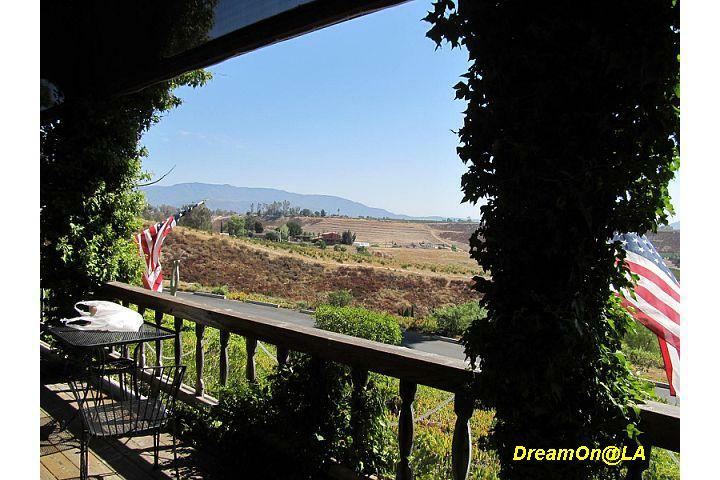 It is North East of Napa Valley. It is 22 miles in length and varies in width from two to seven miles. 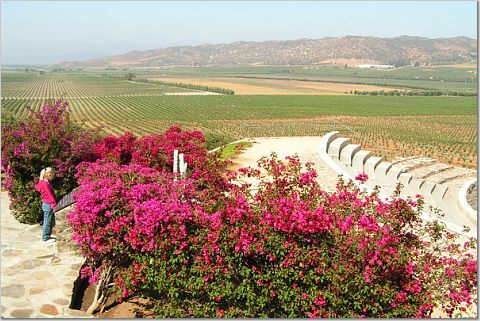 The valley is approximately 76,900 acres, with more than 15,000 currently planted to premium wine grapes. 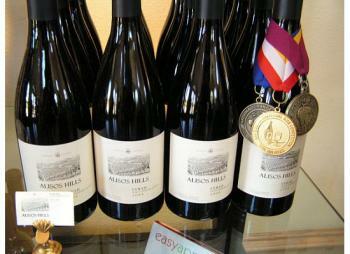 I am a big fan of red wines produced in Alexander Valley, because all wines I tried were excellent. Merlot do particularly well in this region, due to the warm daytime temperatures and cool, fog-covered nights and mornings. 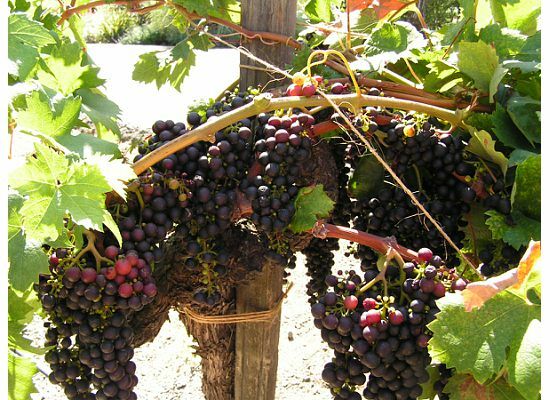 This wine is a fruit-driven style, typical of Geyser Peak Merlot, with lifted red cherry, raspberry and cola aromas complemented by hints of spice, tobacco, cedar and oak. 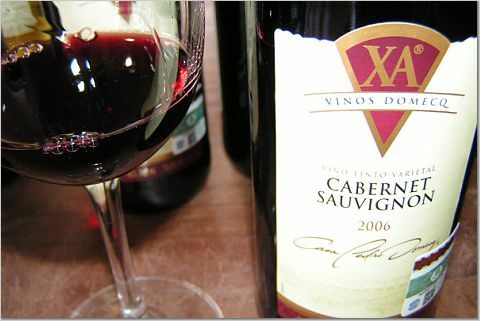 The flavors are bright and lively with juicy cherry and plum fruit and plush, velvety tannins on the finish. 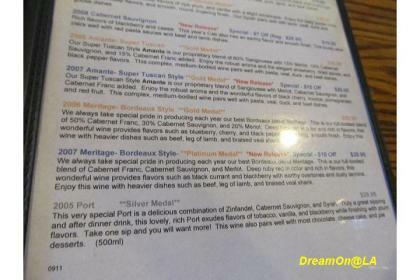 This Merlot wine is sold at $18. 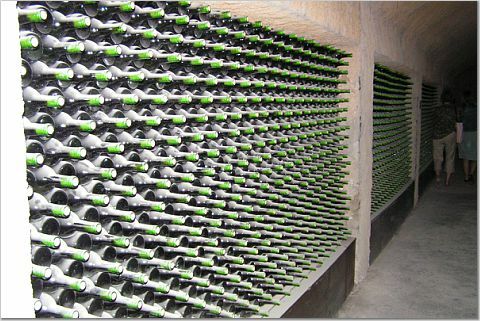 You might find discounted bottles at super markets or on on-line discounted shops. 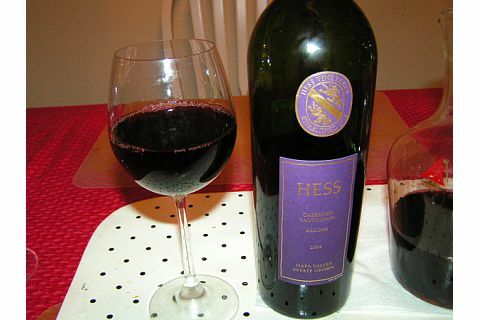 Last night I tried 2004 Hess Allomi Vineyard Cabernet Sauvignon wine that a friend gave me. It went well with Spicy Italian Pasta with Tomato Sauce. First you will notice hickory flabor. 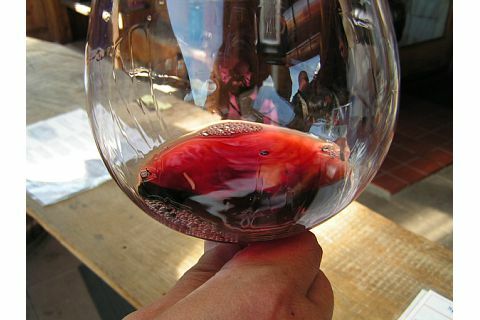 It tastes smooth and full bodied. Cinnamon, Plum, and Cherry flavors ringer on a tang. You do not get tired of this wine. It is around $25 per bottle. It received 90 points. 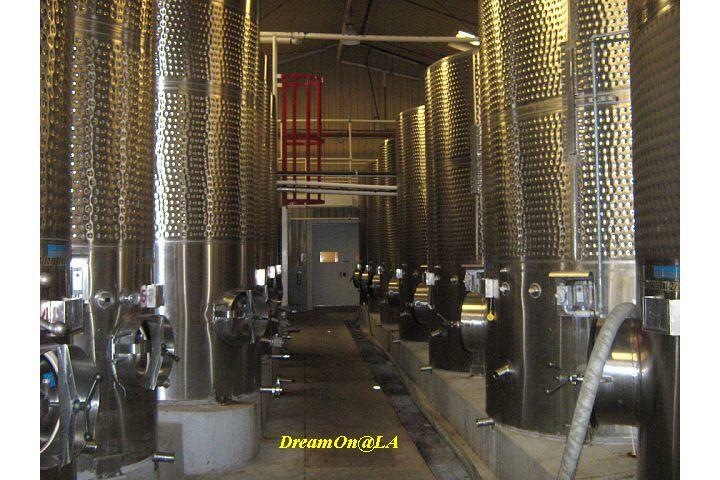 It is made in Allomi Valley, Nappa Valley, California at 770-950 feet above sea level elevation. 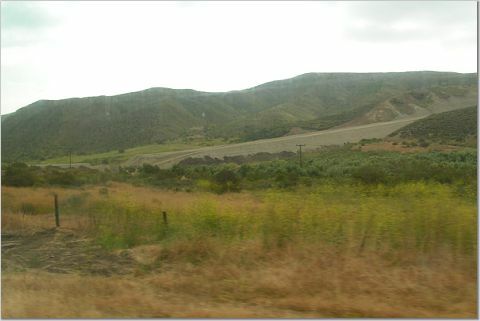 The valley has an exposure to Southwest of a mountain. It's considered as the ideal location to grow Cabernet Sauvignon grapes. 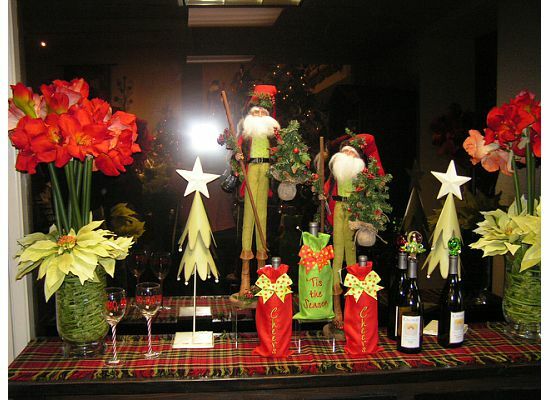 Their wine tasting is open from 10 to 5 daily. 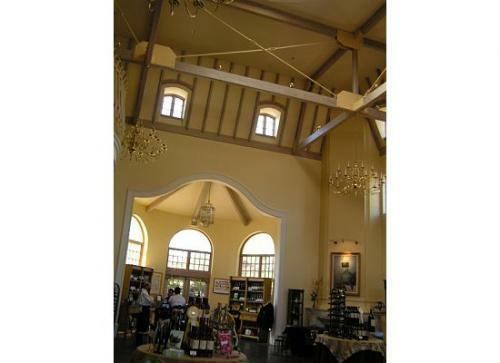 For those, who cannot physically visit the winery, they offer web tasting for wine varieties. This Allomi Cabernet Sauvignon wine is listed at the 3rd from the top on the web site. 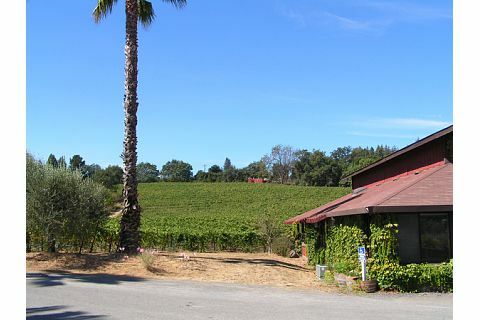 The wine maker, Dave Guffy explains about the location, climate, and conditions of this winery, as well as the taste of this wine in a video clip, about 2 minutes 52 seconds. This winery is also famous as an art collector. They exhibit art collections of 45 years of art works from American, Europe, Africa, and Asia since 1960 at the Art Gallery. 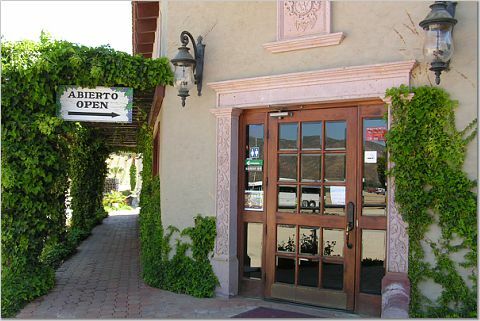 The Art Gallery is open from 10 to 4:45 daily. 89% Cabernet Sauvignon, 5% Petit Verdot, 3% Merlot, and 3% Malbec. and then dovetail into a dark chocolate finish. 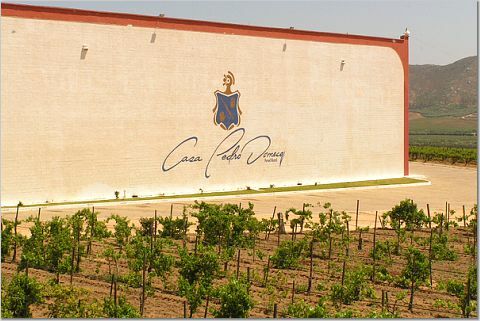 the winery tour bus went to Casa Pedro Domecq Winery. 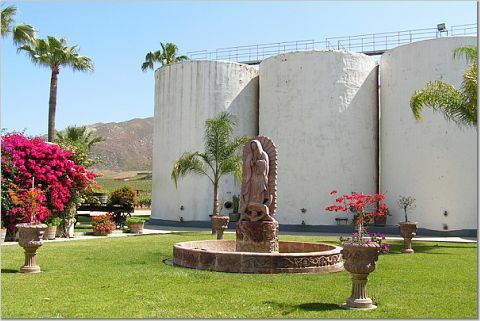 This winery is the second largest in Mexico next to L.A.Cetto winery. 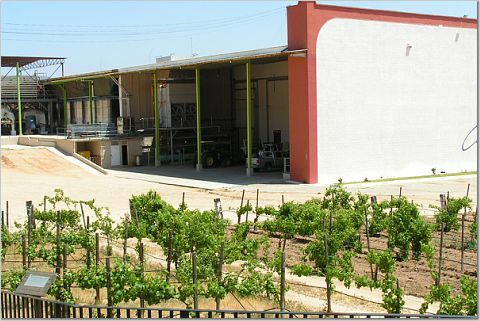 This winery makes brandies, tequilas, cognacs, whiskies, vodkas, and etc. This winery was started by an Irish, Patrick Murphy, in 1730. 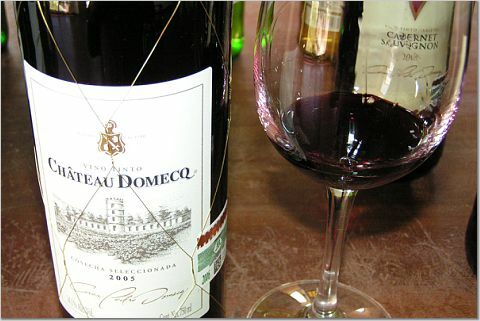 Pierre de Domecq Lembeye, a French wine maker, continued from 1816. 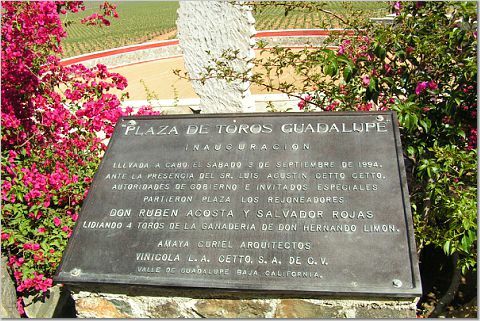 It was acquired by Grupo Allied-Domecq in 1972. 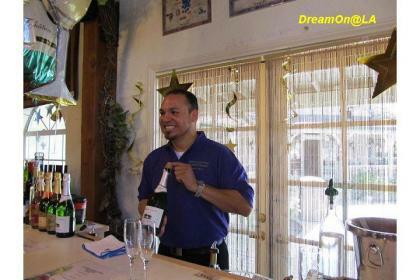 After a free winery tour with a guide, we enjoyed free tasting. 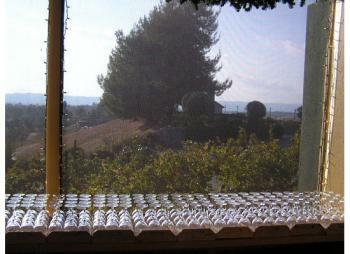 I took photos of all wines and tequilas I tasted at this winery. 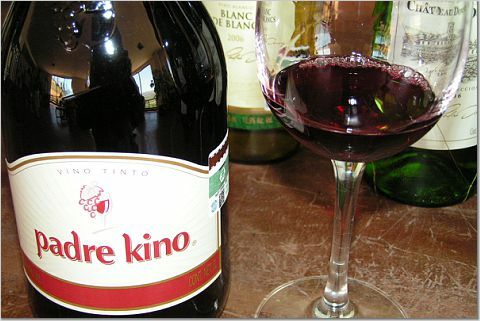 I liked thier Padre Kino vino bianco table wine, the best. 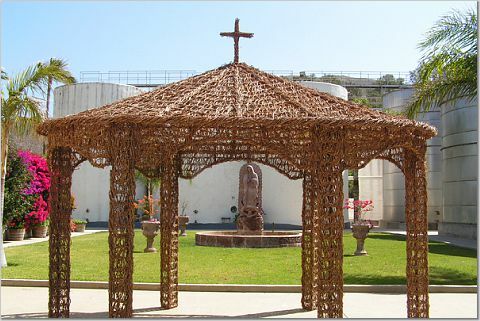 It's made of white muscat grapes. It was smooth and little sweet. I bought one bottle of it at $3.50. It came in a 1000 ml carafe. I wish I could have purchased more, but they did not have a delivery service to our cruise ship, and I did not want to carry heavy load. 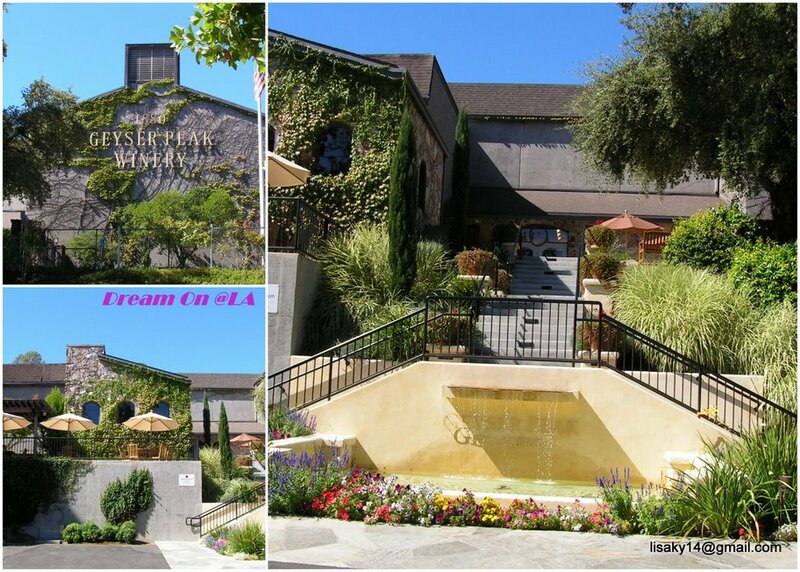 I wish to come back here by car and get lots of wines from here next time, since their wines are not sold in U.S.A. 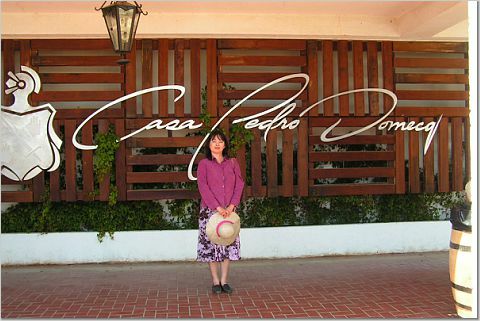 Entering Casa Pedro Domecq winery. 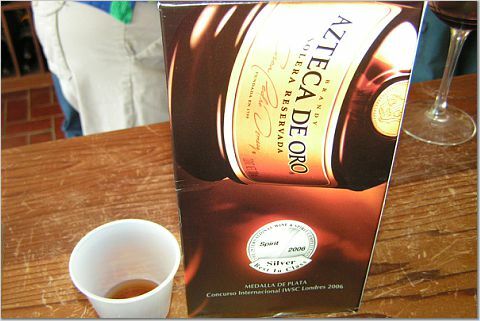 Azteca tequila. It was very very strong. I tasted a little, but I spilled it out, and I still got drunk. 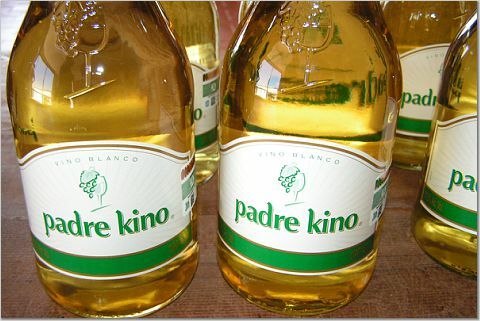 I liked this Padre Kino vino bianca the best. 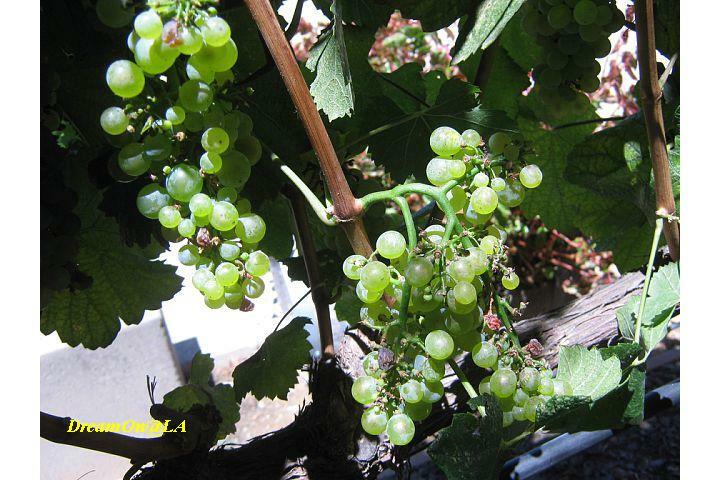 It's made of white muscate grapes. It was little sweet and refreshing. my friend and I selected a "Winery Tour" on Saturday, 4/19/2008. 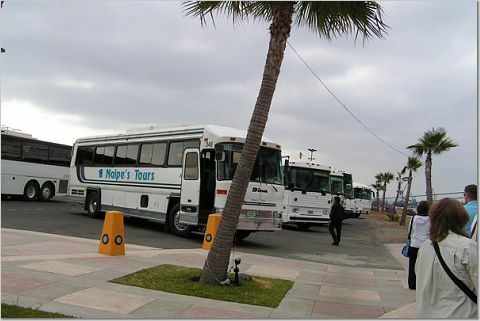 We were supposed to meet a tour guide at the pier, off the cruise ship, at 8:30 AM. 4 to 5 people came late, and the bus departed around 9 AM. 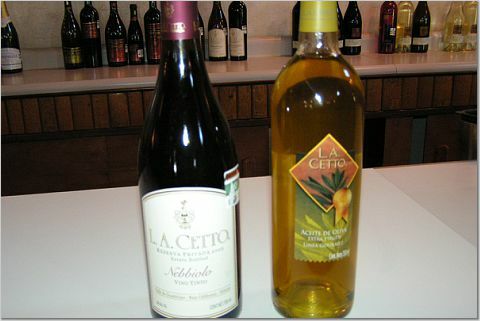 The winery tour took us to L.A.Cetto Winery first. 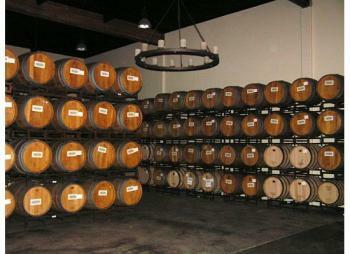 Their wines are sold at San Antonio Winery in downtown Los Angeles. 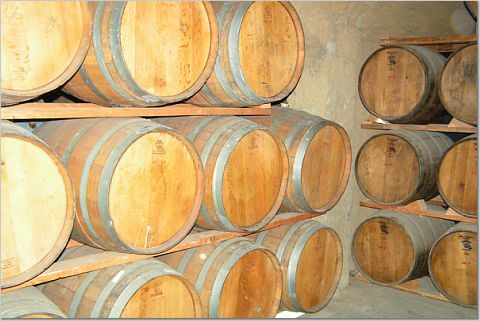 It was found by an Italian wine maker, Don Angelo Cetto, in 1928. 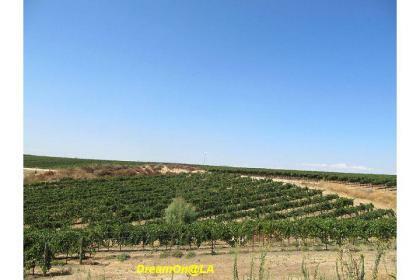 To protect grape vineyards, olive trees were planted. The winery sells organic olives and olive oil as well, and they are tasty. 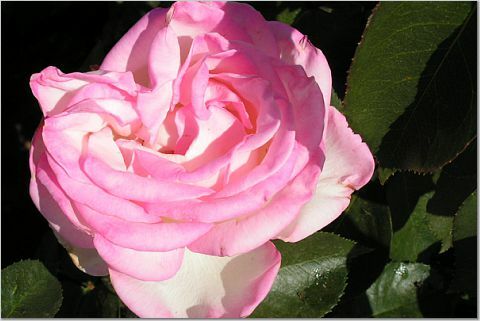 Also to protect grape vineyards, they planted roses. 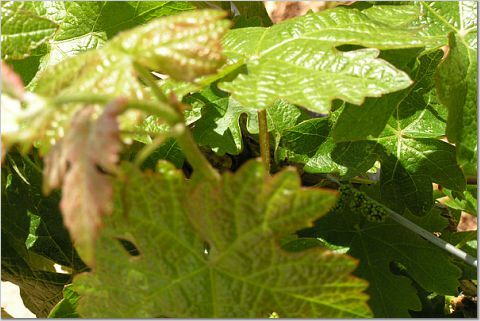 The insects that eat grape vineyards attack roses first. 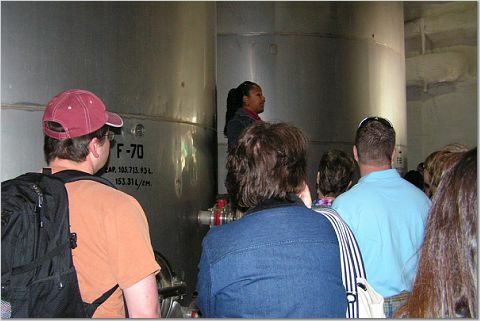 We enjoyed a free tour at the winery and wine tasting after the tour. Their Nebbiolo wine received most awards in Europe, so I purchased a bottle of that wine, a bottle of olive oil, and a bottle of olives. 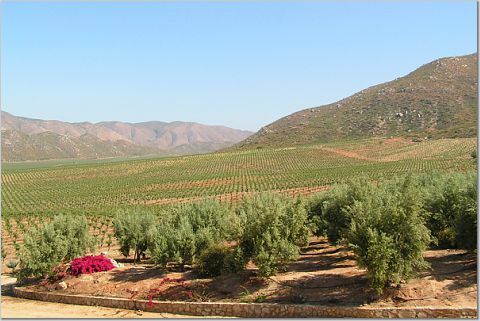 They are growing olive trees to protect grape vineyards from strong winds. 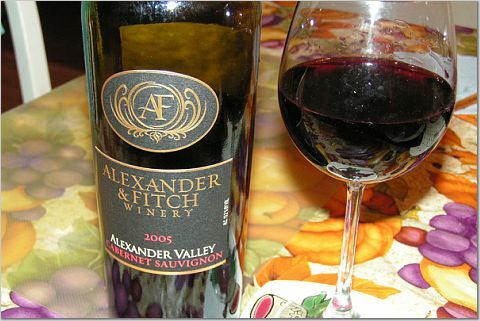 I found this 2005 Alexander & Fitch cabernet sauvignon wine at Trader Joe's this evening at $5.99 plus tax. This 2005 cabernet sauvignon wine is very good. I would rate this at 90 points. 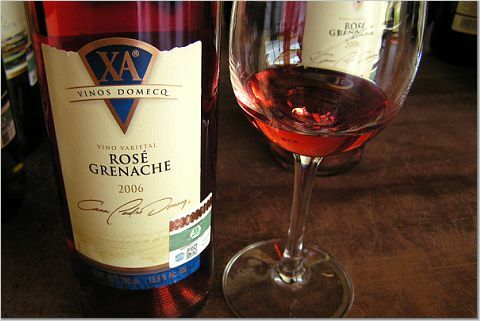 It is smooth and full bodied wine with cherry and oak flavor. This wine is also mysterious. I don't find it at anywhere else. This was the first time I noticed this wine at Trader Joe's store, too. 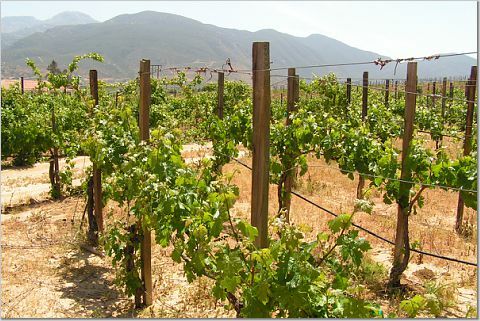 Alexander Valley has a long history of wine making since 1841, and its rich soil is suited for wine making. 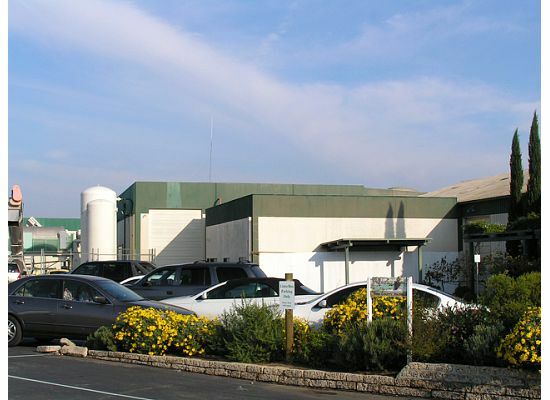 It is at the north tip of Sonoma County, California. I would recommend this wine to any cabernet wine lover. I will go back to Trader Joe's to get some more while the supply lasts. 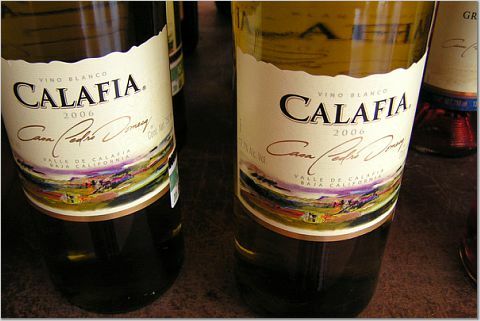 I will attach a blog describing about this wine below. 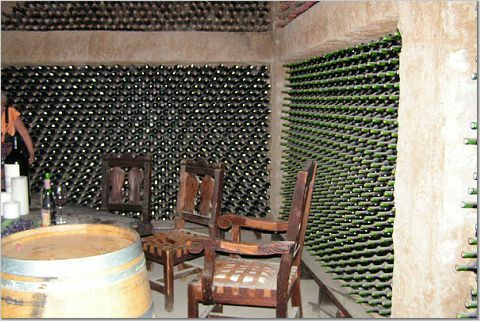 I could not find any website for this winery. 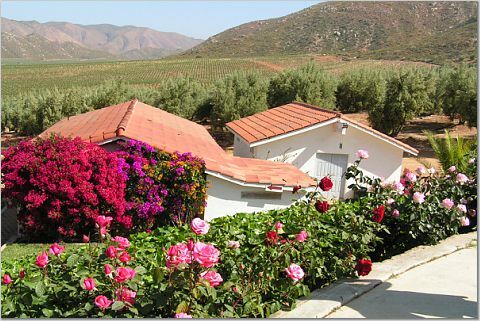 The label does not show address and a home page of the winery, too. It's a mysterious wine. 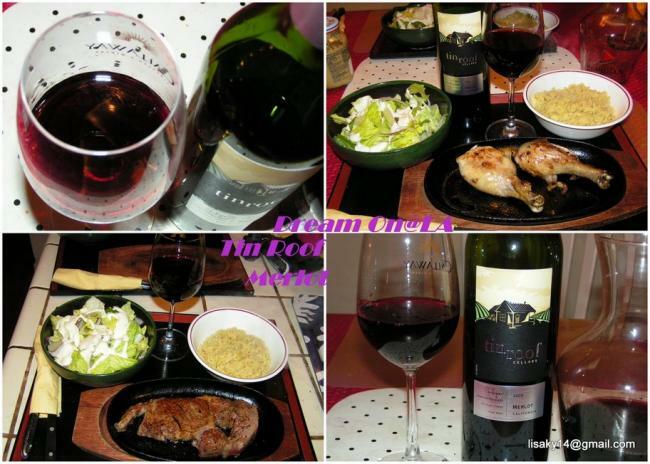 A Wine blog on this wine"